The previous post in this “Return to the Road” blog saga covered the first half of my May 2015 trip through the Midwest. 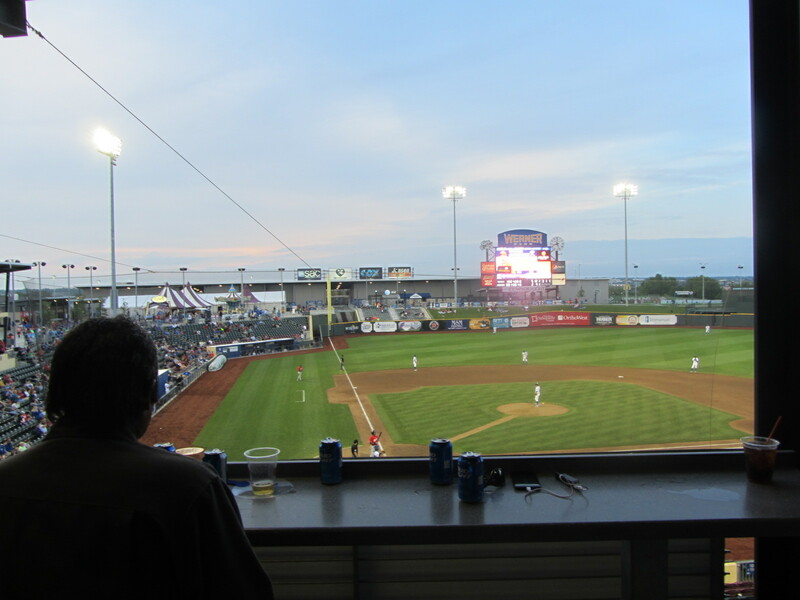 This post finishes the job, detailing my non-ballpark wanderings as I moved from Peoria to Cedar Rapids to Des Moines to Omaha. I arrived in Peoria on the night of May 25 and thus had some free time in the early afternoon before attending May 26’s Chiefs game. When I have a small window of free time in a city that I’ve never been to, I find a record store to visit. It’s just what I do, as I’m a creature of habit. This is Ribbon Records, a hybrid record and vintage clothing shop which, according to this blog post, is in a building formerly occupied by Murray’s Department Store. The hours of this place are kind of spotty, but luck was on my side. May 26 was a Wednesday. Ribbon Records had a lot of used records, as well as books, DVDs and random cultural ephemera. At Ribbon Records, the stacks were alive. I ended up buying a small pile of albums, four of which I can recall immediately at this moment. That Nancy Sinatra LP is produced by Lee Hazlewood, and if you ever see Nancy and Lee’s names together on the same album then do not think. Just buy! The only other things I can tell you about my time in Peoria, outside of the ballpark, was that I ate lunch at Lorena’s…. …and, afterwards, got unreasonably excited when Eminem came on the radio. 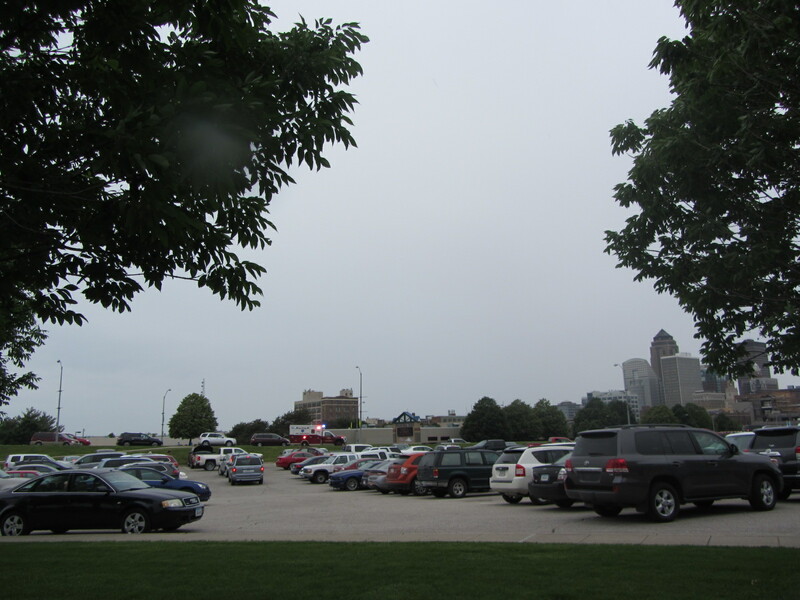 On Thursday, May 27, I drove from Peoria, Illinois, to Cedar Rapids, Iowa. Along the way, I picked up the necessary provisions. It is obscene how much I enjoy pork cracklins. I also bought “Warheads Sour Dippin’ Pucker Packs,” simply because I am always on the lookout for Fun Dip derivatives. I’m not sure where the following photo was taken, but clearly it was a beautiful day in which to loiter at a rest stop. A rest stop is one thing, the “World’s Largest Truckstop” is another. How could I not visit? I can’t verify the “world’s largest” claim, but there is no doubt that this truck stop was gigantic. This picture doesn’t do it justice, as this place was too big to be encompassed by a single photo. I strongly considered buying a T-shirt as a means to show off my vague awareness of nature and Native American culture. 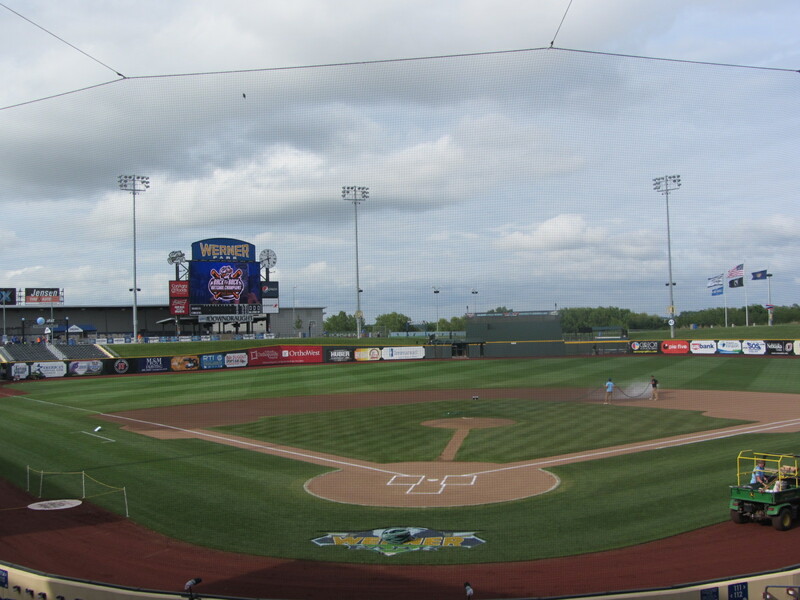 I spent the evening of May 27 with the Cedar Rapids Kernels, leaving the city early the next morning. Cedar Rapids, I hardly knew ye. 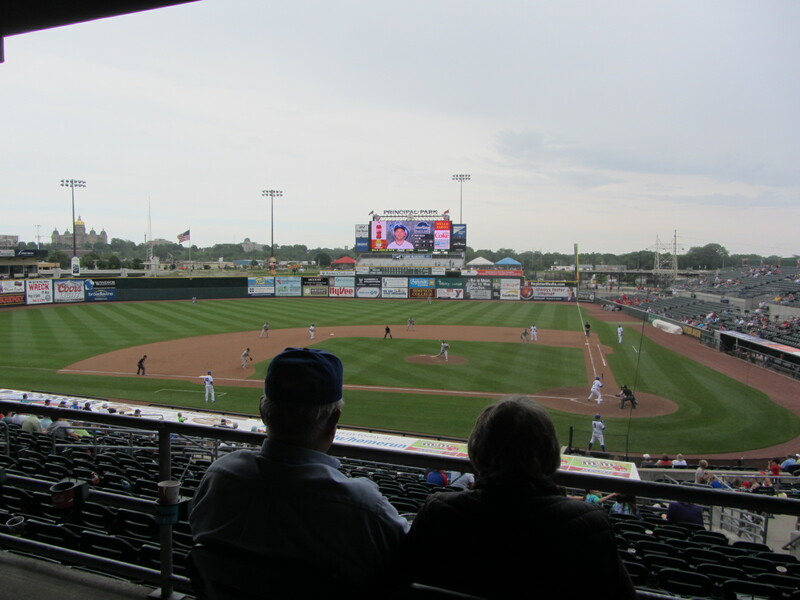 May 28 was devoted to an Iowa Cubs matinee in Des Moines and then an Omaha Storm Chasers game in the evening. The next morning, before flying out of Omaha, I stopped at Almost Music. I somehow failed to take a photograph of this establishment, so here’s one from the Yelp page. Almost Music, while small, was well-organized and featured a lot of off-the-beaten path kind of stuff for the heads and weirdos in your life. I picked up an R. Stevie Moore record (“Delicate Tension”) as well as a CD from local emcee Macey Yates (I had asked the guy at the counter to recommend an Omaha artist completely removed from the Saddle Creek universe). And then? Then I went home. There are a lot of things I like about living in New York City, but you don’t get to see nearly enough bird’s nests. Thanks, Midwest, for the memories. Earlier this month, I wrote a series of “Return to the Road” posts detailing my non-ballpark experiences during April’s trip to Florida. Today, I’ll move on to similar material, this time centering around late May’s quick jaunt through the Midwest. 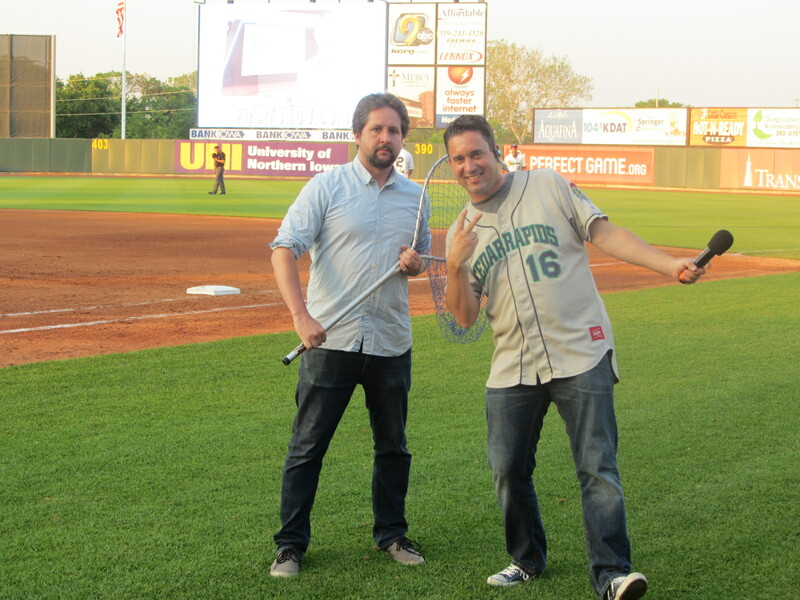 May 23 was a whirlwind — an early flight from NYC to Chicago, an extremely long wait for a rental car, a quick hotel check-in and then a jam-packed evening with the Kane County Cougars. It was all a blur, and that feeling persisted into the next morning. I had no idea which car in the hotel parking lot was mine! I took both of them, just to be sure. 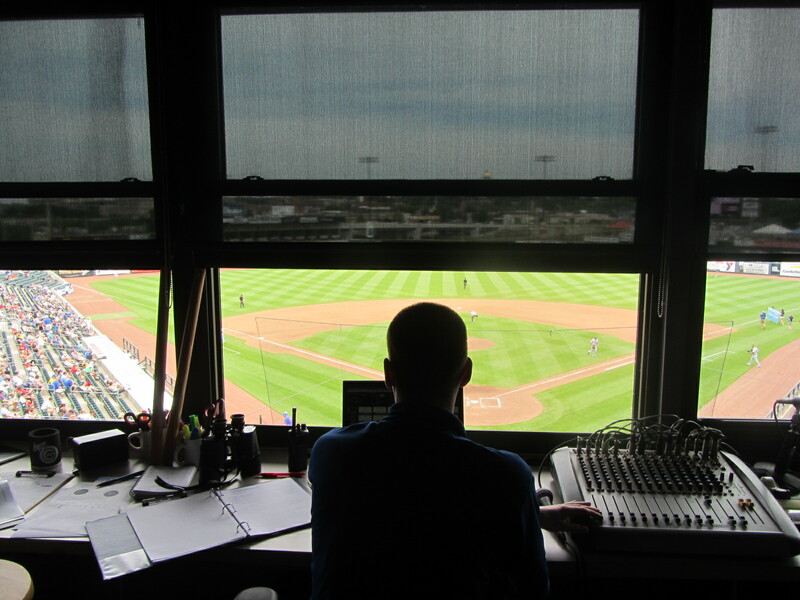 From there it was on to a (rained out) afternoon with the Quad Cities River Bandits, followed by an early evening drive to Clinton, Iowa. At some point during this drive, I took a picture of some amusing rest stop bathroom graffiti. I wish that I could share it with you in full, but this is a family blog (you’re probably reading this with your family right now, as Ben’s Biz is one of the few things that unites the average American family in this fractured media age). Upon arriving in Clinton, I was hungry. And when I am on the road and hungry, I generally seek out one of four (reliably gluten-free) options: barbecue, Mexican, Vietnamese or Buffalo Wild Wings. Clinton, a factory town, came through on the Mexican front. This restaurant, as you can see, was in close proximity to a smoking lamppost. Despite an 80 percent ingredient overlap from dish to dish, El Tapatio had a menu whose length was roughly equivalent to that of the Old Testament. The next morning, May 25, I drove to Clinton’s Eagle Point Park and took a stroll. While I had less than an hour in which to wander around the premises, I’m glad that I visited Eagle Park. 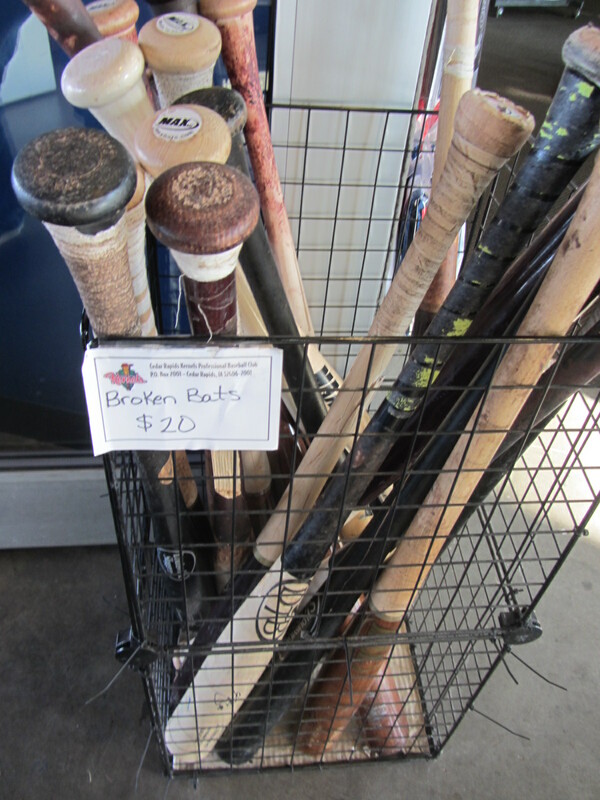 If you should ever be in Clinton, to see the LumberKings or otherwise, then I suggest that you do so as well. The park overlooks the Mississippi River, which, as it runs past Clinton, is at one of its widest points. I would have liked to meditate in this location for upwards of three hours, but, as always, duty called. Soon enough, I was on the path back to reality. Reality remained a whirlwind, but on the way to see the LumberKings I took the time to pull over and take a photo of Snodgrass Motors. This brief pit stop was motivated by then-Richmond Flying Squirrels (and now Virginia Tech) broadcaster Jon Laaser, who consistently paid tribute to pitcher Jack Snodgrass via creative use of the “word” Snodgrass. Last night I introduced the term Snodgrass as a verb. 2night the definition: To dominate the competition. T-Shirts in the works. 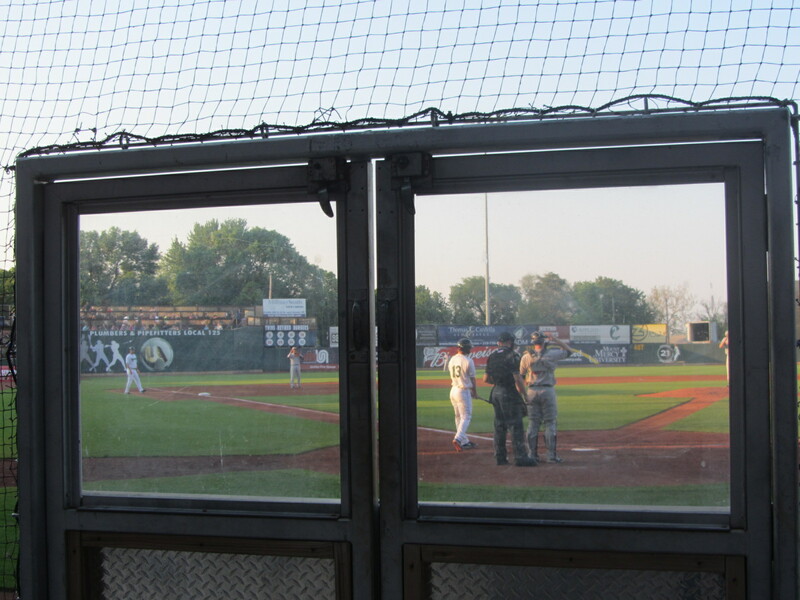 After witnessing a Memorial Day doubleheader in Clinton, I drove back to Quad Cities and caught the second game of the River Bandits’ doubleheader against the Chiefs. From there, it was time for a nighttime drive to Peoria so that I would be well-positioned to see those very same Chiefs the following evening. The second — and final — entry of this Midwest-based “Return to the Road” saga will begin in Peoria. We’ll see how it plays. 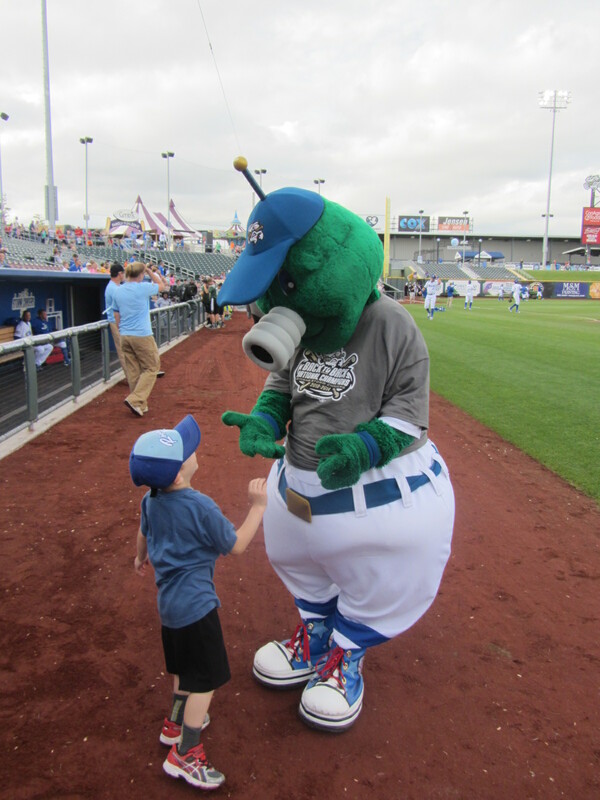 To see all of posts from my May 28, 2015 visit to the Omaha Storm Chasers (this is Part Three) click HERE. To see all of the posts from my May 2015 trip through the Midwest, click HERE. To see ALL of my “On the Road” posts (going back to 2010), click HERE. 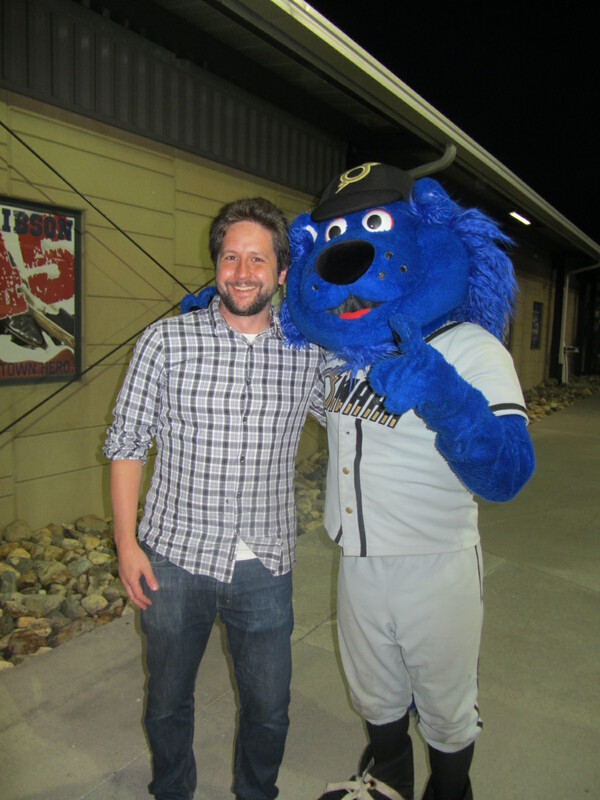 Shortly after May 28th’s Omaha Storm Chasers game began, I rendezvoused with a fan by the name of Paul Biler. But Paul was not just any fan. Paul was that evening’s designated eater (you know, the individual who consumes the ballpark cuisine that my gluten-free diet prohibits). I picked the right man for the job. Paul is “from Toledo by way of Utica,” but has lived in Omaha since 1997. His family made the move to Nebraska after his wife got a job as a private investigator for a health insurance company. Paul now works for Mutual of Omaha, but he also has an extensive background as a radio deejay. His most recent work in that regard was for Omaha oldies station KGOR, but for the majority of our time together his mouth would be used for the consumption of food. That, in a nutshell, is why Paul volunteered to be designated eater in the first place. “I can eat,” he said. OMAHA, Neb. 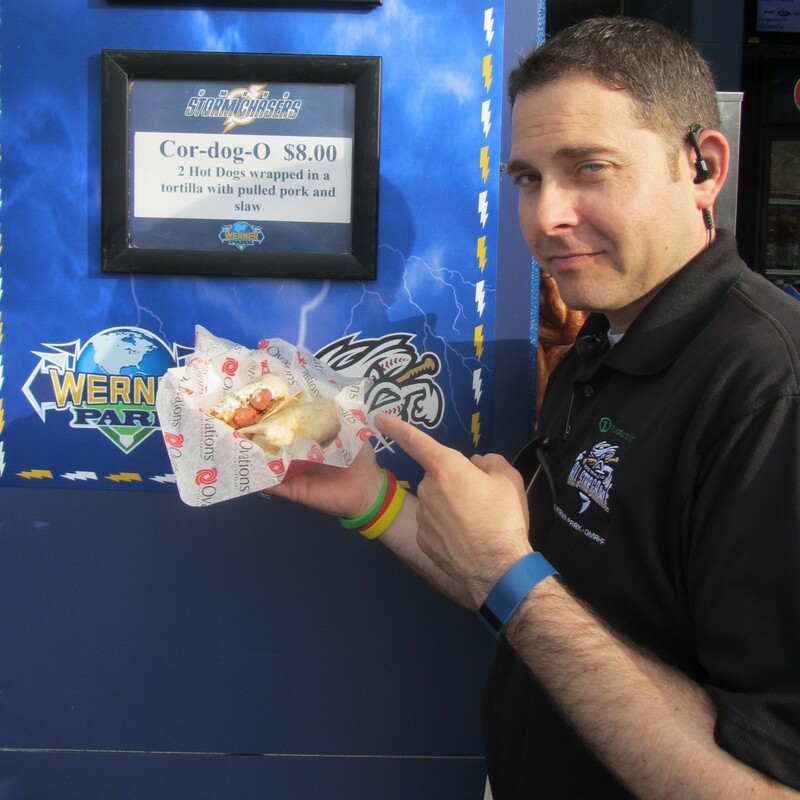 – This season the Omaha Storm Chasers are bestowing their President and General Manager Martie Cordaro with the highest honor a Minor League Baseball team can give: naming a hot dog after him. 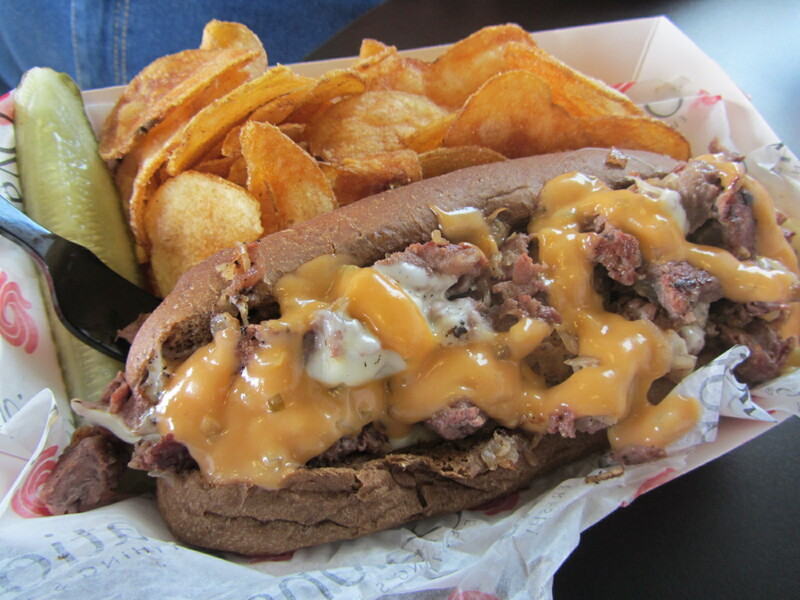 The “Cor-Dog-O” is one of many new food items fans can try this season from Ovations Concessions at Werner Park. A concession item that was long overdue, only the “Cor-Dog-O” can truly reflect the “interesting” personality and style of Martie Cordaro. 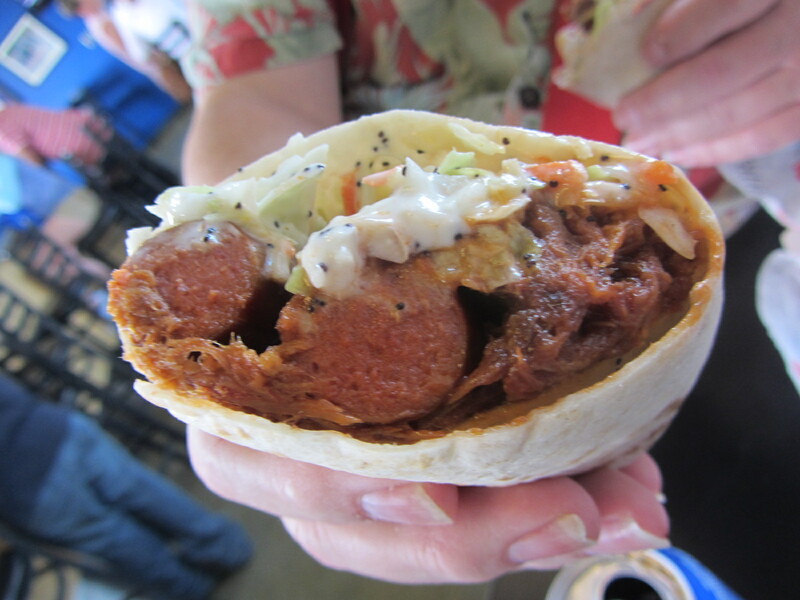 The specialty item consists of two hot dogs, pulled pork and coleslaw wrapped in a tortilla shell, one of the only hot dogs at Werner Park that is not served in the traditional hot dog bun. 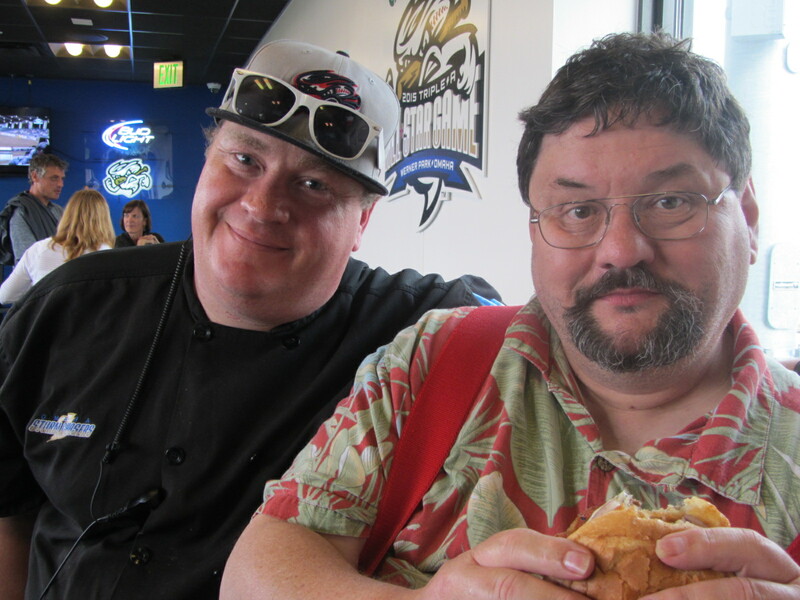 When informed by Storm Chasers executive chef John Schow that the barbecue sauce used was local favorite Cookies (a molasses-based sauce), Paul was enthused. 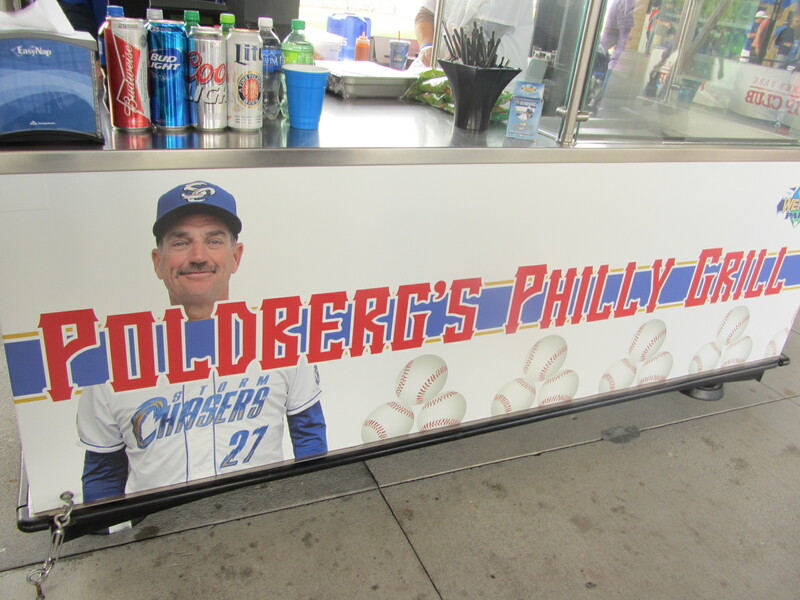 Next up was an item that can be procured at “Poldberg’s Philly Grill,” named after Storm Chasers manager Brian Poldberg. 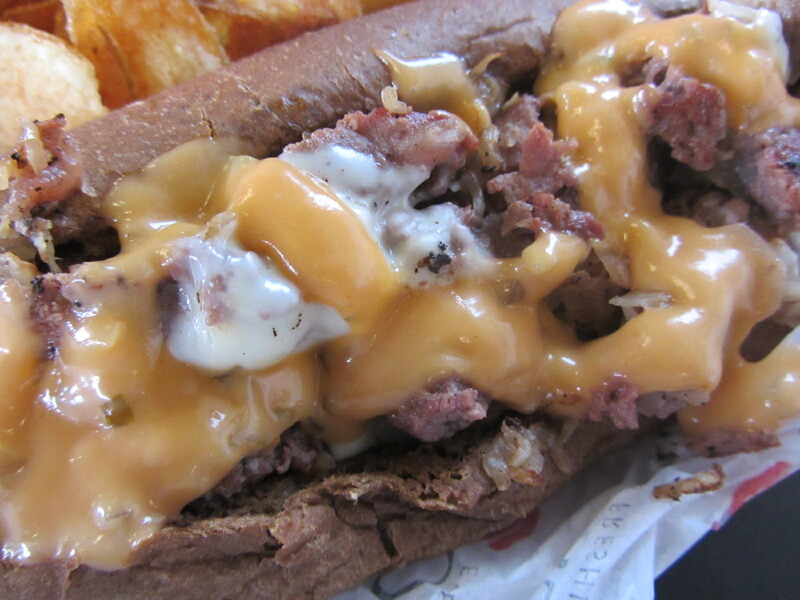 That item is the “Ruben Philly” — chopped corned beef, sauerkraut, Swiss cheese, rye and 1000 island dressing on a hoagie bun. 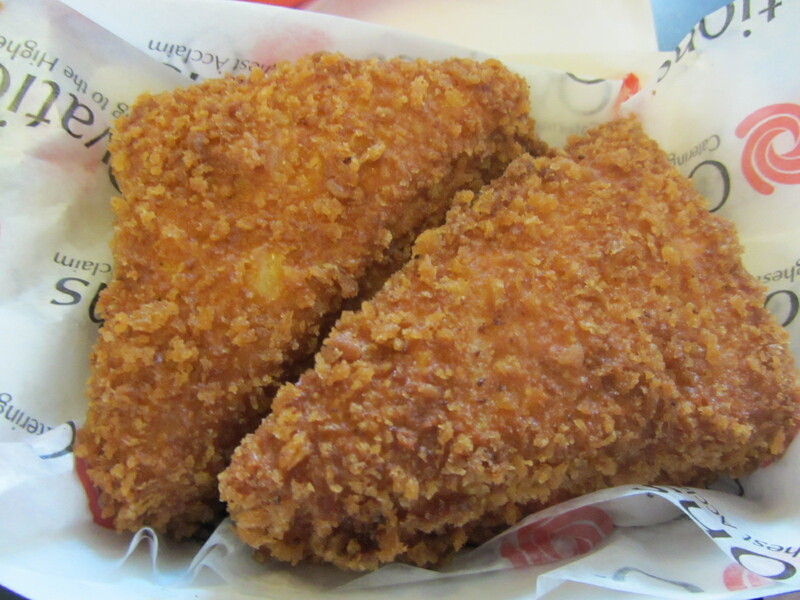 It’s served with a Schwartz-brand pickle and chips (made in-house). Oh, man. Let’s take a closer look. 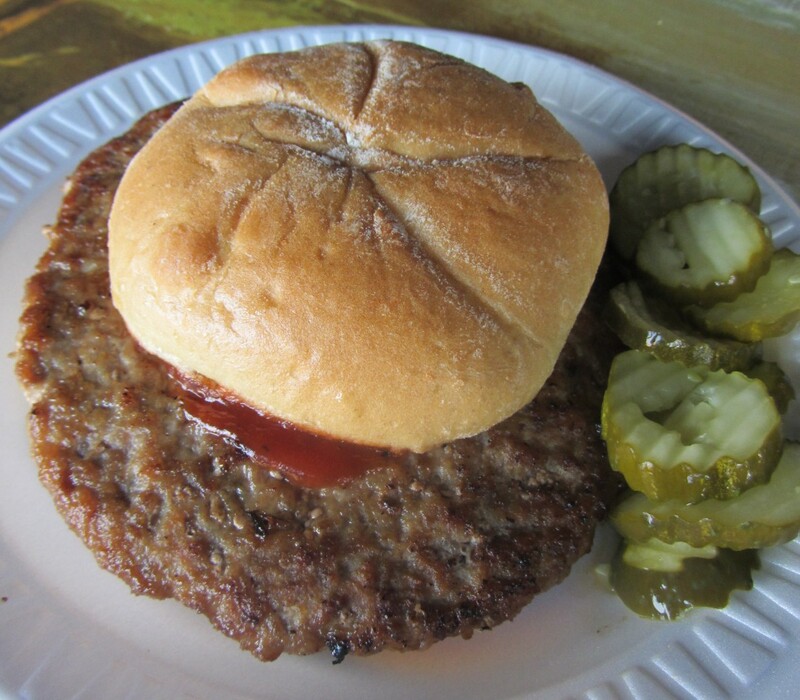 We then moved on to the Champ Burger, created by Schow in 2013 after the Storm Chasers won the PCL Championship. 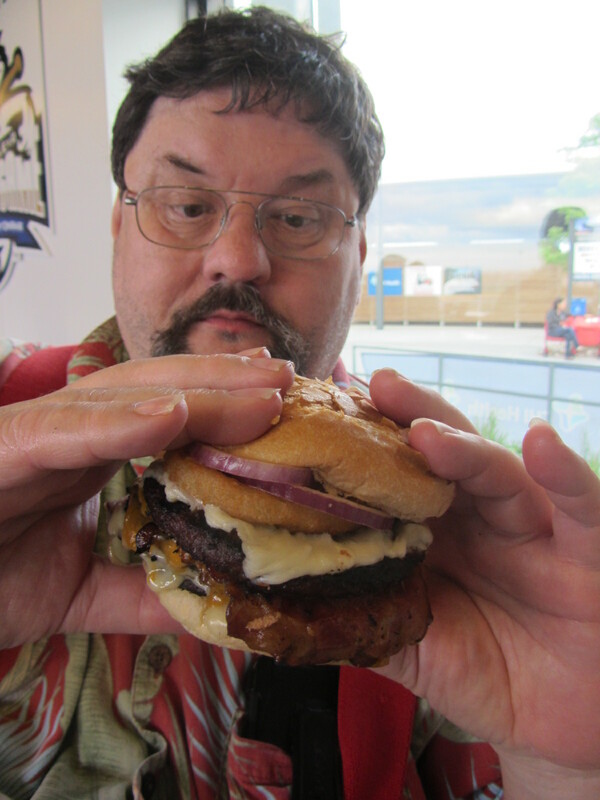 It consists of three 1/3 pound patties, bacon, ham and onion rings. Paul was ready for it. Schow, like a lot of food and beverage guys I’ve met in this industry, absolutely loves working at the ballpark. It’s a casual environment that allows plenty of room for fun and experimentation. 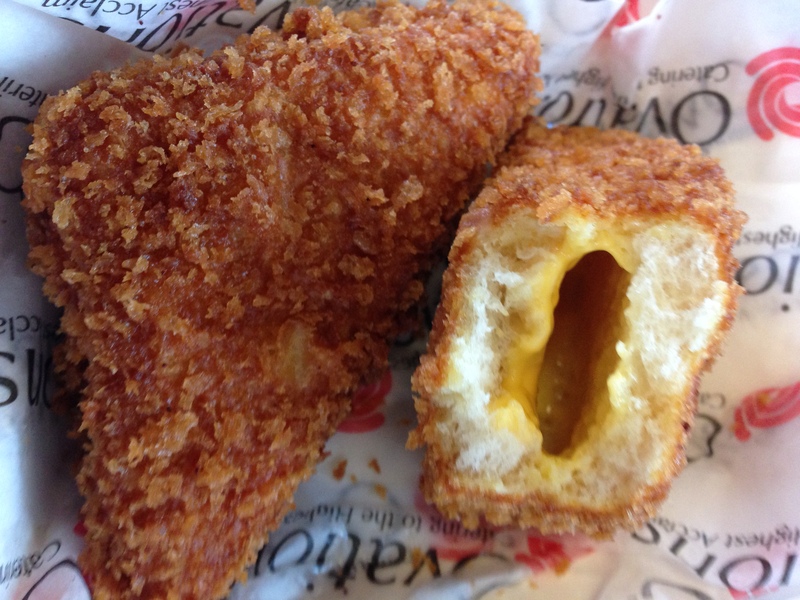 This is the Midwest delicacy known as the “Frenchee” — American cheese on white bread, deep-fried. “Is the bread Rotellas?” asked Paul, referring to a beloved Omaha bakery. “Of course it’s Rotellas,” replied Schow. These two were definitely on the same wavelength. “Say a prayer for me,” added Paul, overwhelmed by the amount of food he was now dealing with. “Sir, I have a couple times already,” replied Schow. If you want a Frenchee outside of the ballpark, Paul mentioned that local restaurant Don and Millie’s is known for them. But that was a rare criticism of what was clearly a fantastic culinary experience. 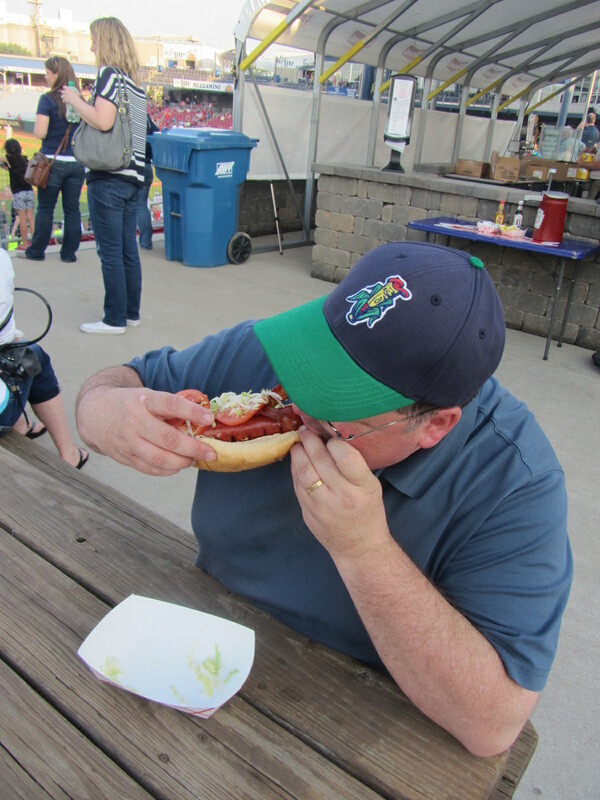 I’m writing this post some three weeks after visiting Omaha, but for all I know Paul is still at the ballpark making his way through what was a most prodigious dinner. He sure had his work cut out for him. 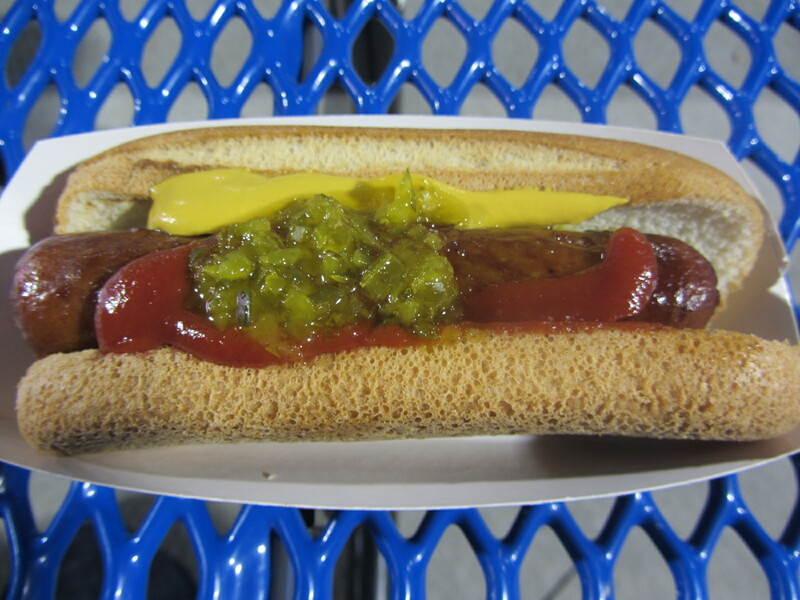 Oh, and for the record: I would like to commend the Storm Chasers for offering gluten-free hot dogs at the ballpark. 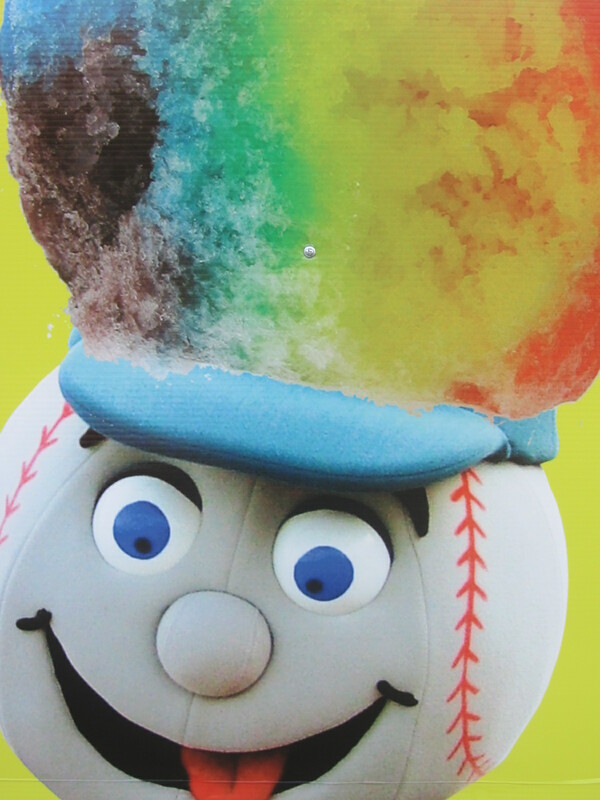 I enjoyed one later in the ballgame. 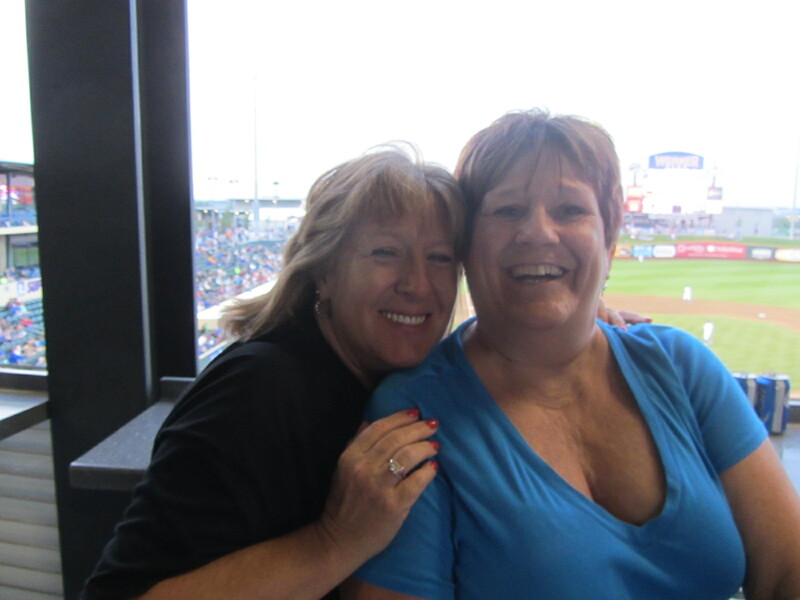 To see all of posts from my May 28, 2015 visit to the Omaha Storm Chasers (this is Part Two) click HERE. To see all of the posts from my May 2015 trip through the Midwest, click HERE. To see ALL of my “On the Road” posts (going back to 2010), click HERE. Oh, that’s right. I was at a Minor League Baseball game. A Pacific Coast League Baseball game, to be exact, though I was nowhere near the Pacific Coast. 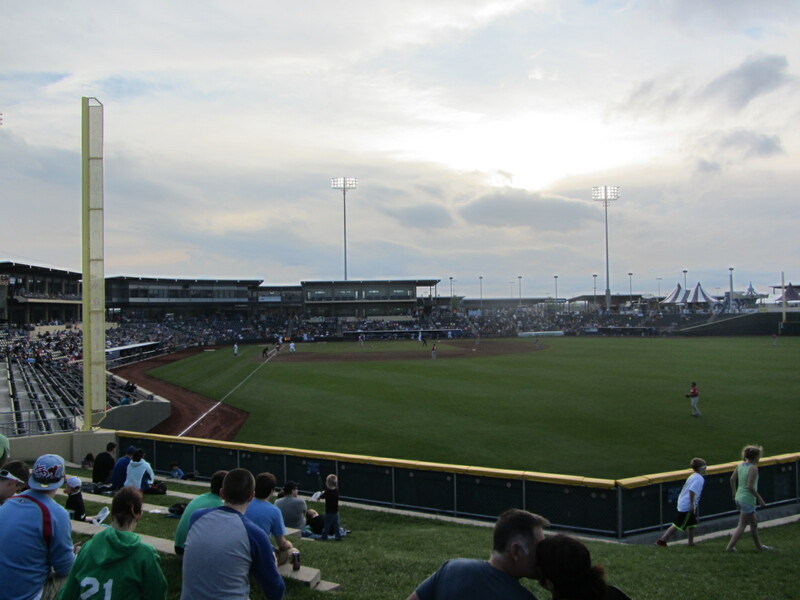 Welcome back to Werner Park, home of the Omaha Storm Chasers. 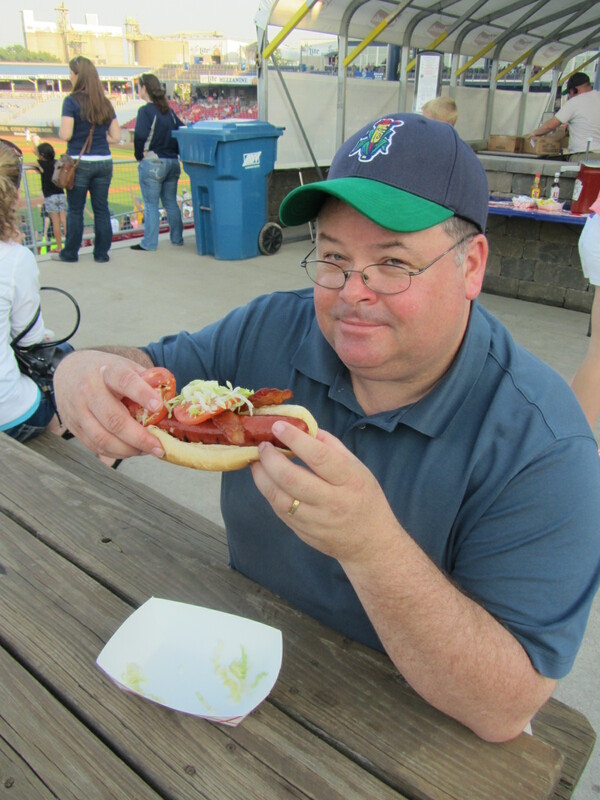 I spent the first several innings of the ballgame with one Paul Biler, the evening’s designated eater. We’ll get to him in the next post. 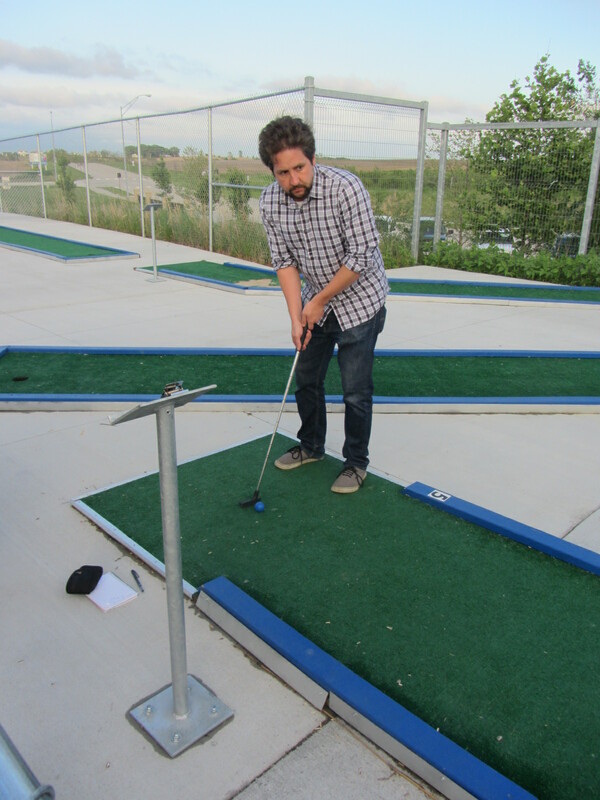 After parting ways with Paul, I played a few holes of miniature golf on the concourse. 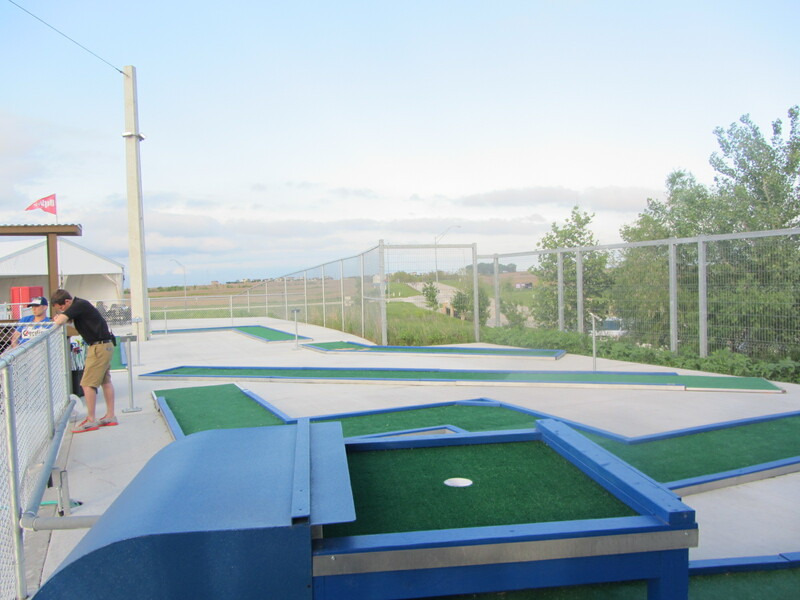 The course, new this year, costs $3 to play. After sinking a birdie (or was it a bogey? ), I snapped a photo of a couple making out on the berm. I wasn’t intending to. I was accompanied by general manager Martie Cordaro throughout these wanderings. 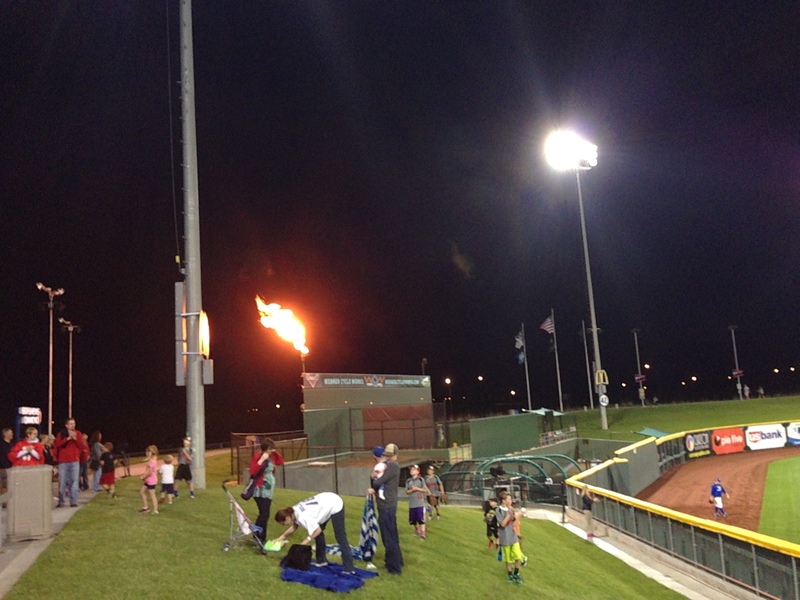 He pointed out that the scoreboard shoots flames after each home run as well as after each Storm Chasers victory. See those propane tanks hooked up in the back there? I made it a goal for the evening — to take a photo of the flaming scoreboard. I’d already missed an opportunity in the third inning, when I was otherwise engaged with Mr. Biler, when Francisco Pena hit a solo shot. Beyond the scoreboard is an impressive array of flags. 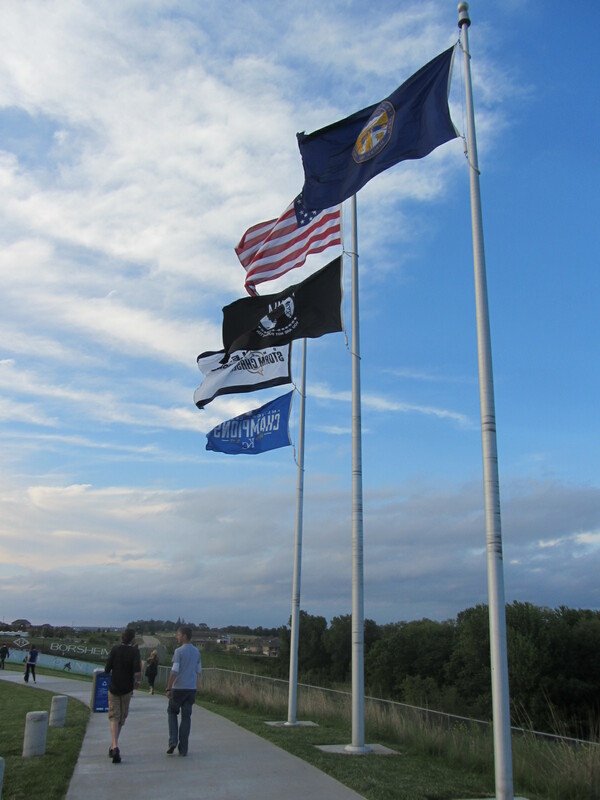 The blue flag on the far left celebrates the American League champion status of the Kansas City Royals, but it should not be overlooked that the Storm Chasers have won back-to-back Pacific Coast League championships. 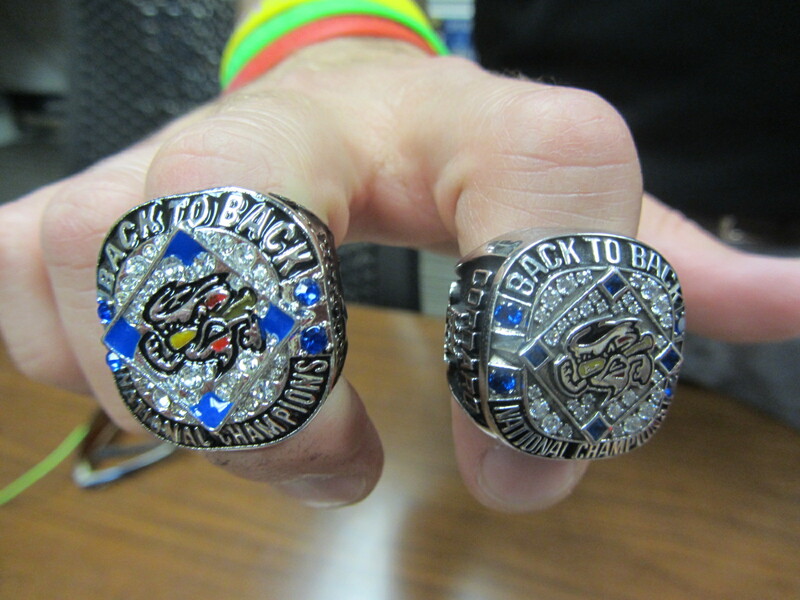 Here’s Martie modeling his 2014 PCL championship ring on one finger, and a giveaway replica ring on the other. Can you tell which is which? 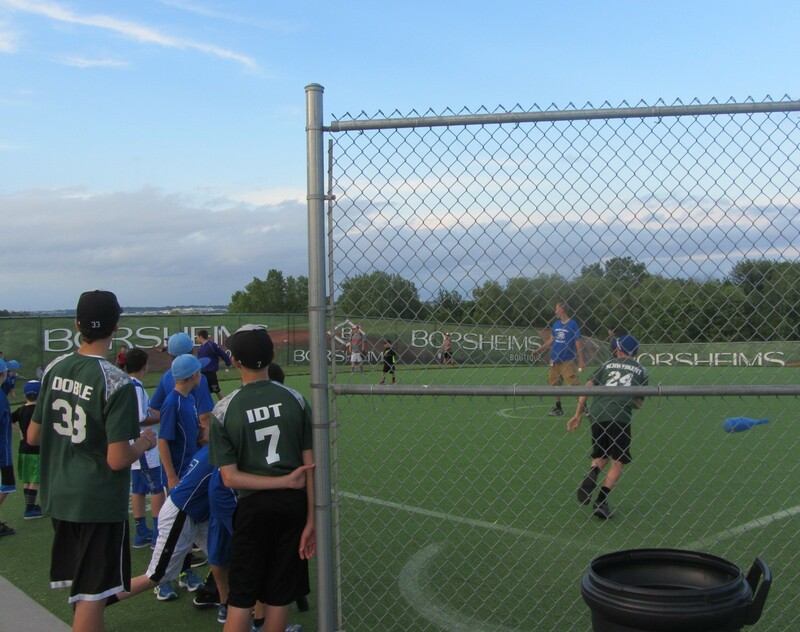 One of the many benefits of inhabiting a large acreage stadium is that Wiffle Ball fields can be installed on the premises. 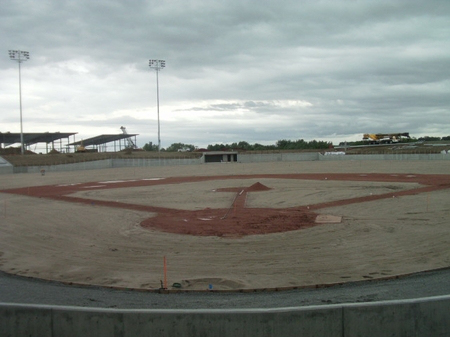 The field is real grass; the Storm Chasers have already replaced the sod twice. 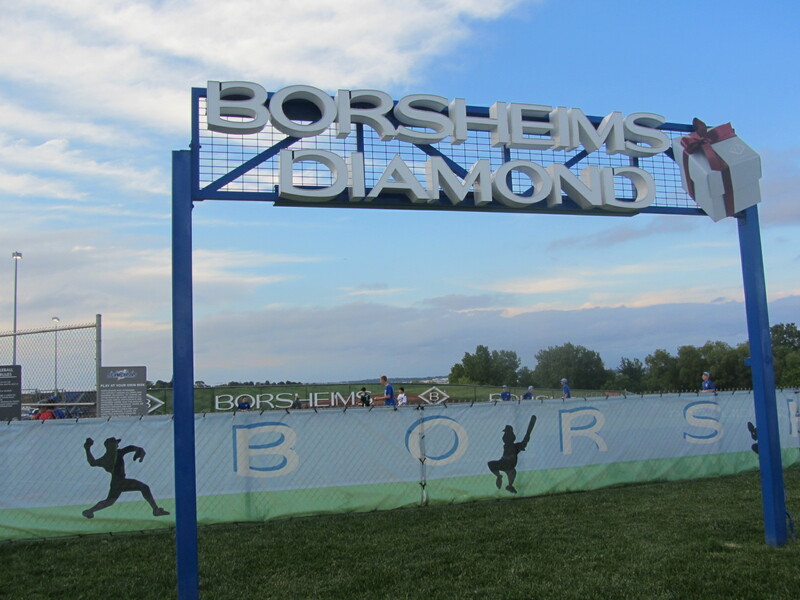 The blue metal poles in the sign seen above were taken from the team’s previous home of Rosenblatt Stadium. 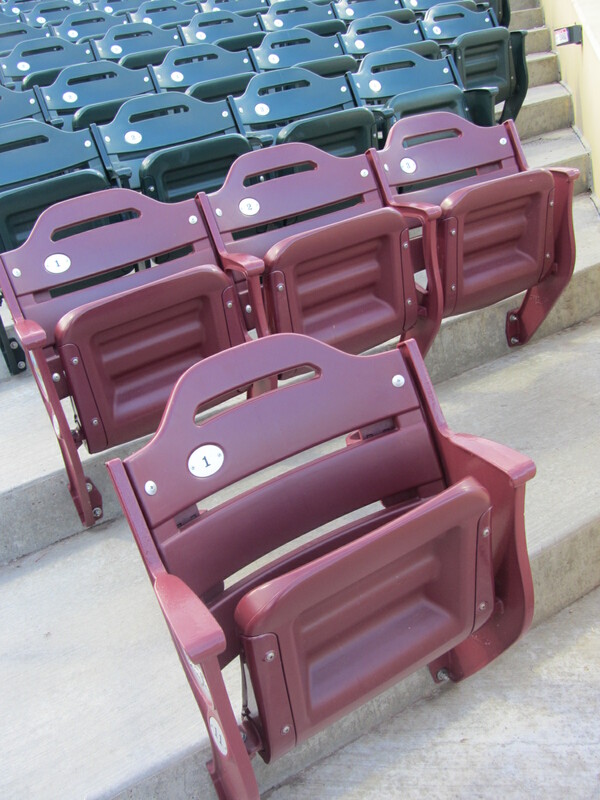 The Mike Jirschele Dugout Suite, named after longtime Omaha manager-turned-Kansas City-third base coach, is located down the third base line. 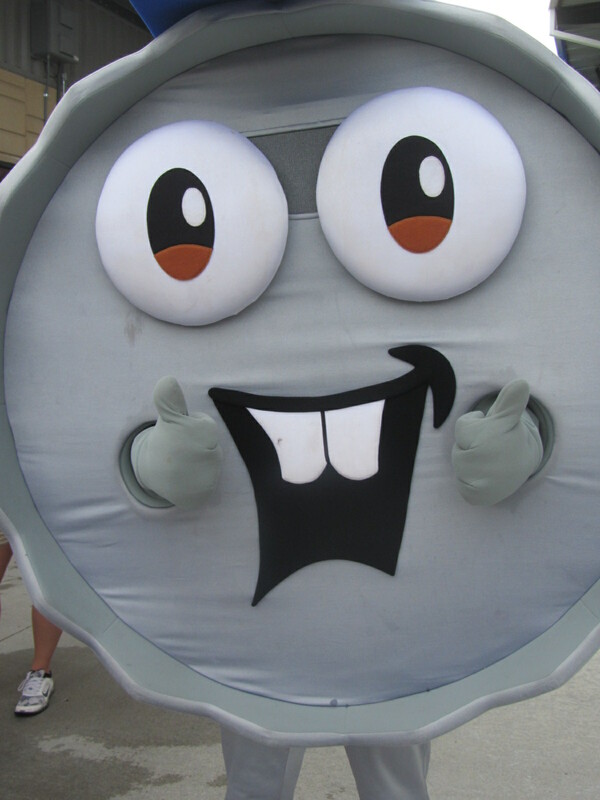 I kept running into this bottle cap dude. This was the last game of the homestand; shouldn’t he only appear during the opener? 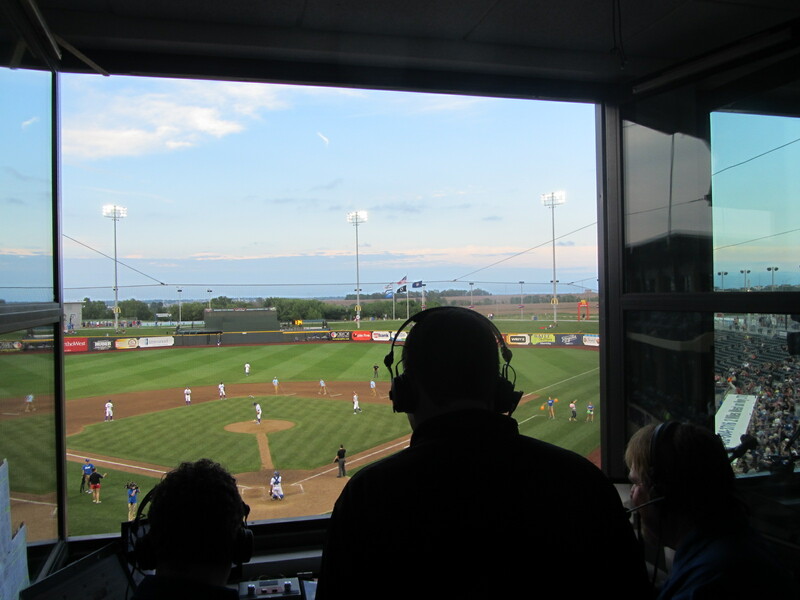 We then made a press box pit stop, where Martie did an inning on the radio. Sure, fine, leave the big-time visiting celebrity on the outside looking in. I passed the time perusing the old yearbooks hanging on the walls. The view from the Cambria first base party deck. These women were having a great time up there. With the ballgame winding down, I paid a visit to section 118. 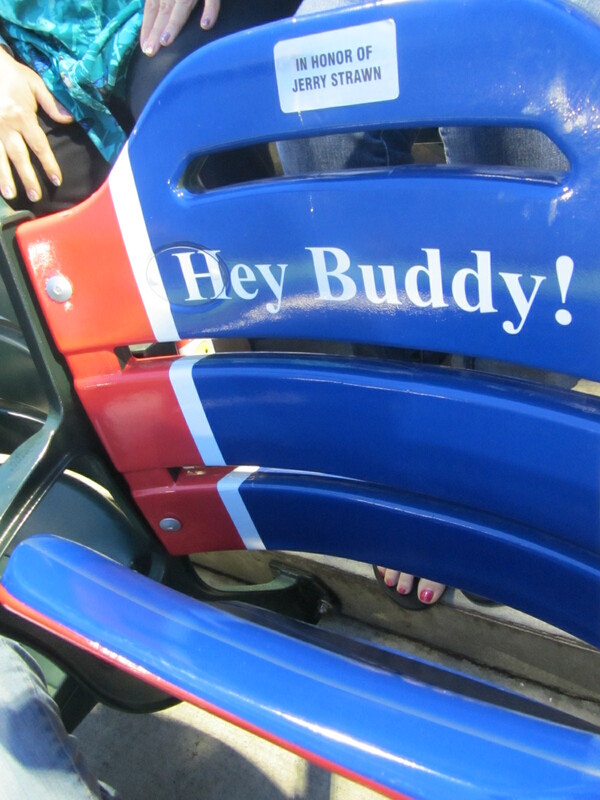 Jerry Strawn, a well-known figure at the ballpark and in the Omaha community, passed away suddenly during the offseason and his fellow fans paid tribute with a seat bearing his catch-all catch phrase. Read all about it on MiLB.com. 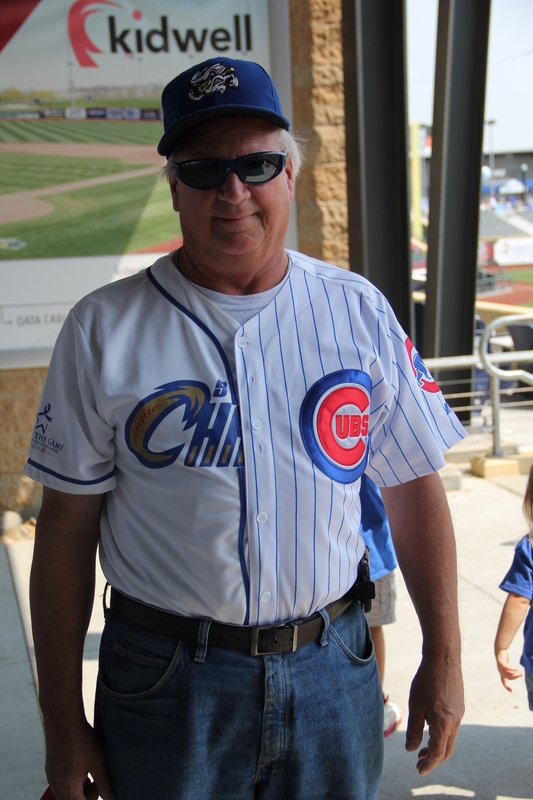 Jerry Strawn, in his signature Cubs/Storm Chasers jersey. In honor of Jerry Strawn. Hey Buddy! 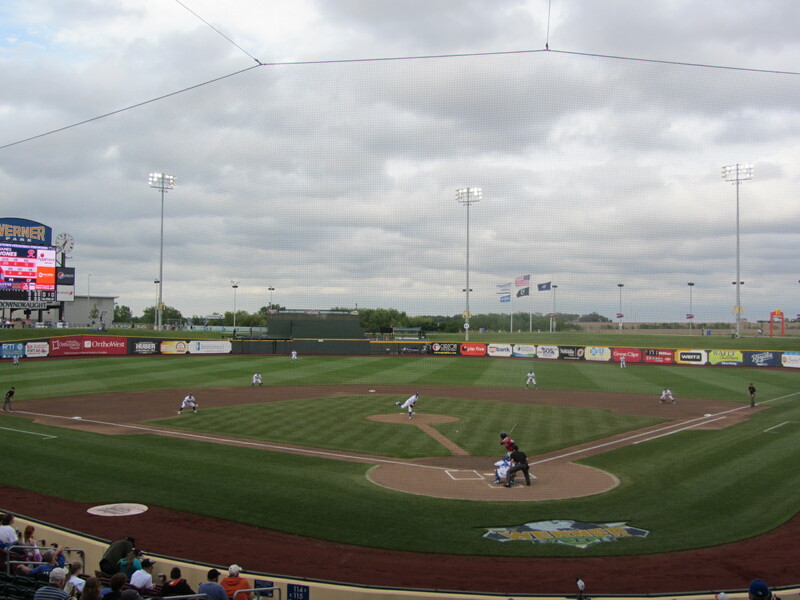 The Storm Chasers scored two runs in the bottom of the ninth to knot the game at 5-5. Time for extra innings on this, the last day of what had been an exhausting road trip. At this point no fewer than four Storm Chasers had hit home runs, and I had yet to capture an image of the flaming scoreboard. And, hey! Flaming scoreboard. My night was a success. My jokes are usually not a success. But I ‘m gonna keep making them. And that’ll be all from Omaha. I had a great time, and I’m not lion. 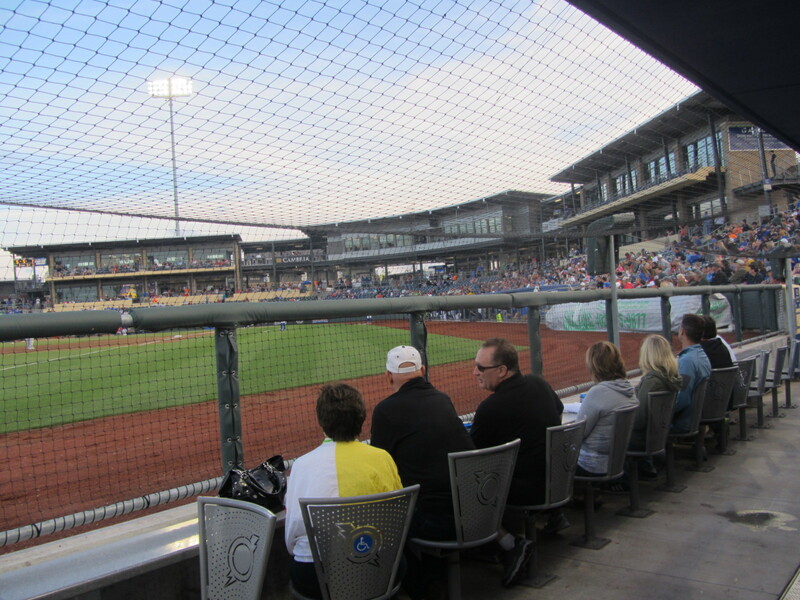 To see all of posts from my May 28, 2015 visit to the Omaha Storm Chasers (this is Part One) click HERE. To see all of the posts from my May 2015 trip through the Midwest, click HERE. To see ALL of my “On the Road” posts (going back to 2010), click HERE. 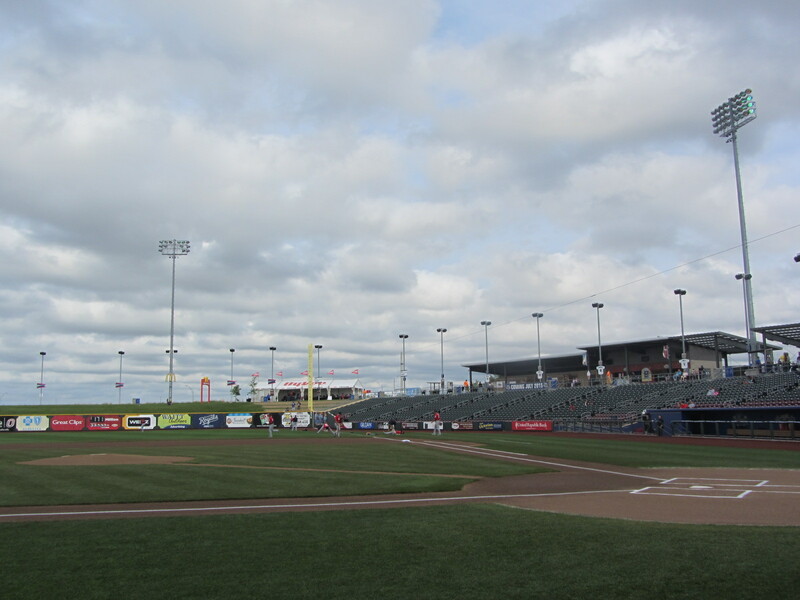 The last time I was in Omaha was September of 2010, attending the final game at Rosenblatt Stadium. 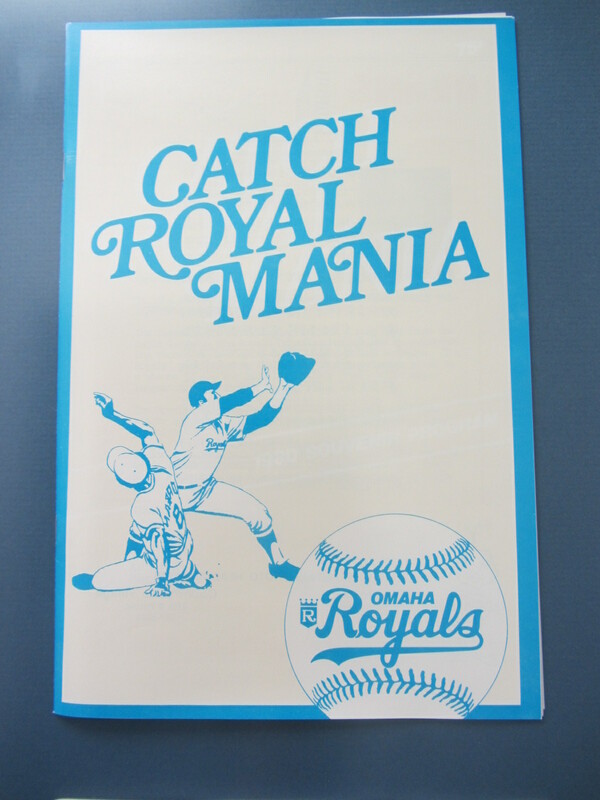 The city’s Pacific Coast League team, then known as the Royals, was slated to move to a new stadium in the nearby town of Papillion the following season. 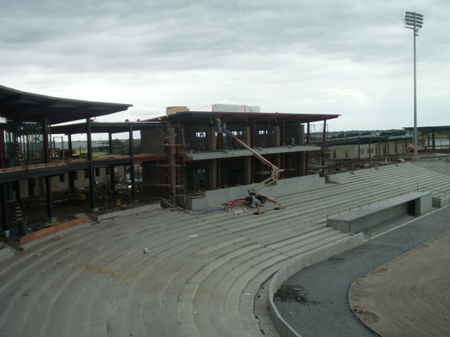 As part of this 2010 visit, I swung by the stadium construction site and got a sense of what this new facility would look like. 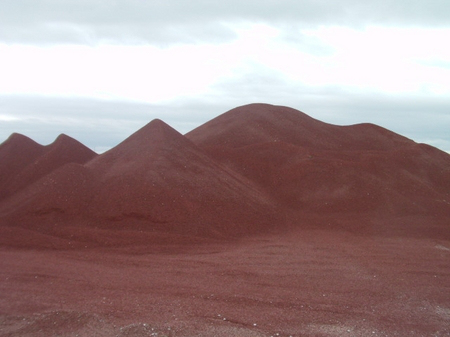 I think my favorite image, though, was this: piles of warning track dirt, looking like sand dunes on another planet. Cut to May 28th, 2015, when I ended my Midwest road trip with a visit to this same location. Much had changed. 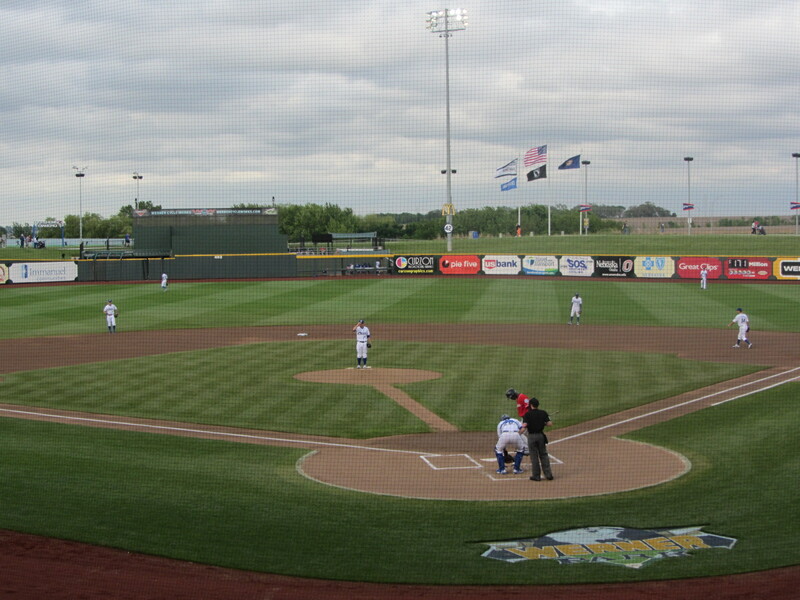 The stadium, now known as Werner Park, is home to the Omaha Storm Chasers. 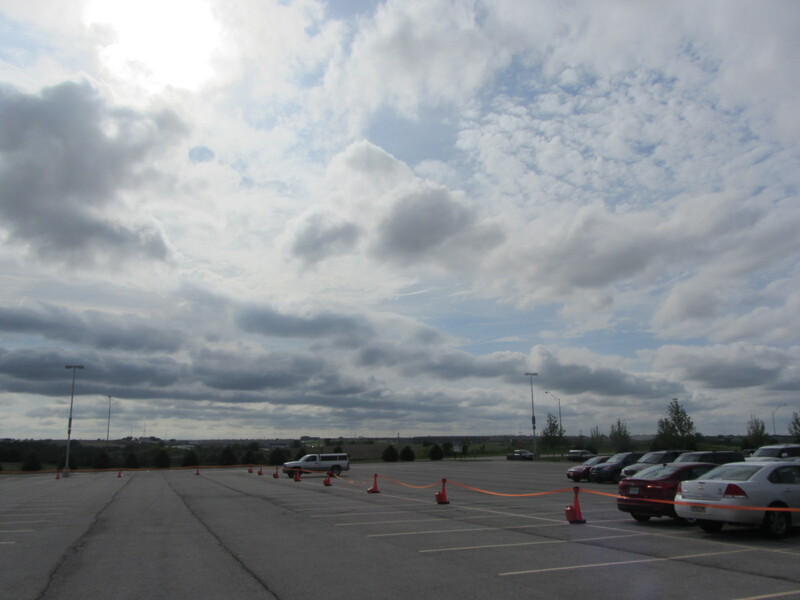 If nothing else, the parking is ample. 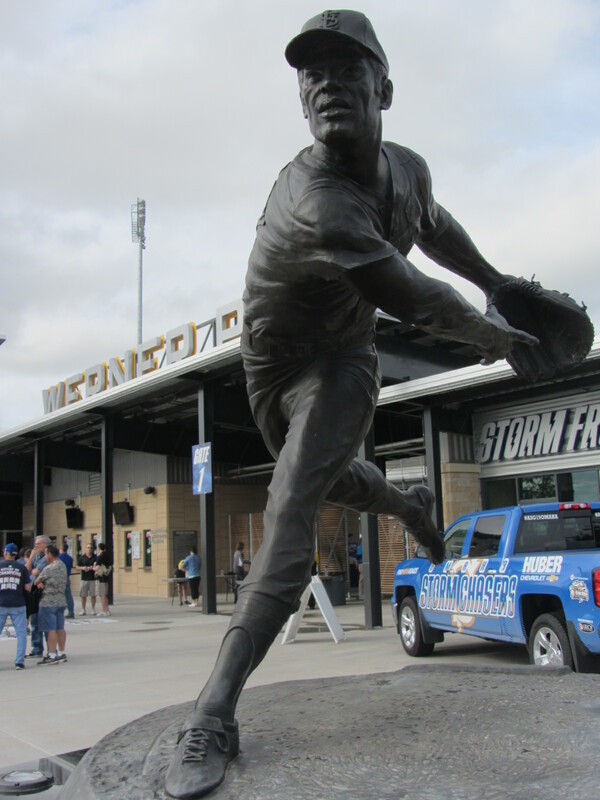 A statue out front pays tribute to noted Nebraskan Bob Gibson. 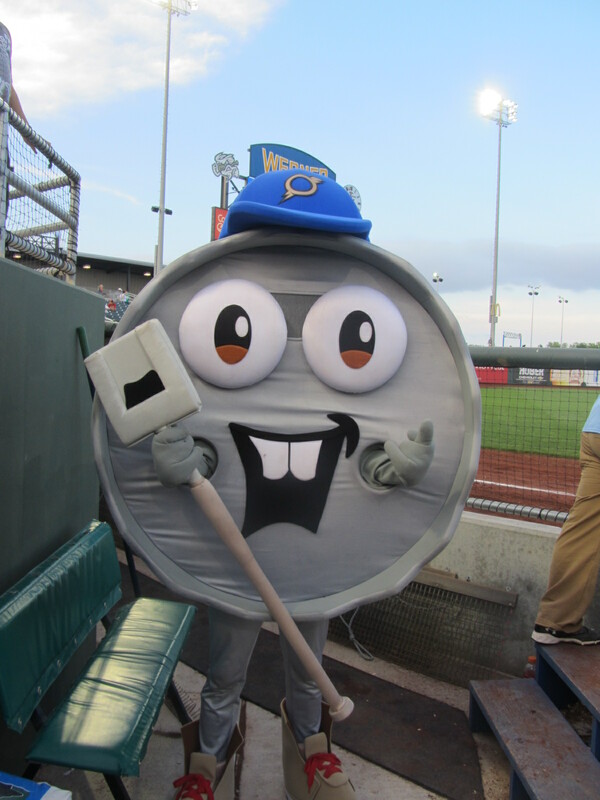 The Storm Chasers have a large cadre of mascots, but I’m not sure if this one is part of the official roster. Regardless, he (she? it?) was there to greet me when I arrived. 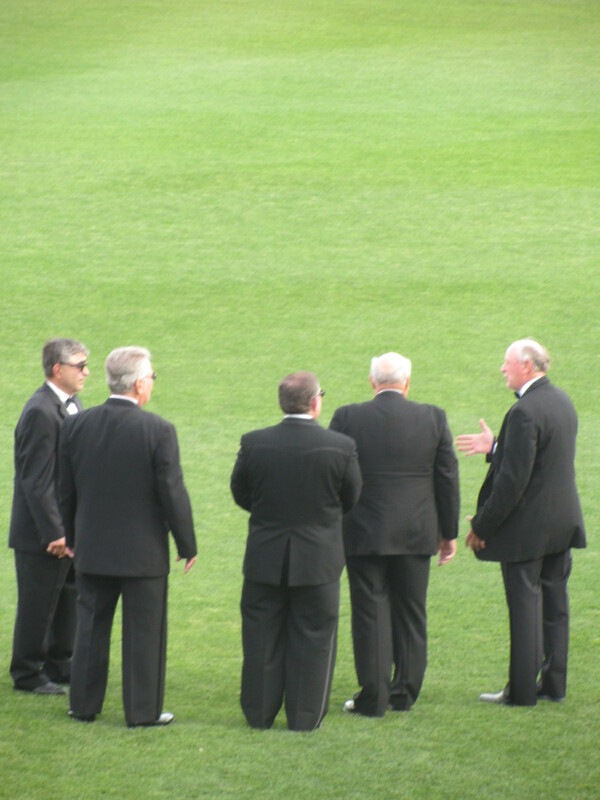 During my exploratory lap around the ballpark, I noticed a group of well-dressed men standing in the outfield. I have no further information to offer. The area surrounding the ballpark still possesses a rural feel. However, Storm Chasers general manager Martie Cordaro reports that 150 houses are under construction in the immediate area, as well as additional commercial and recreational development. 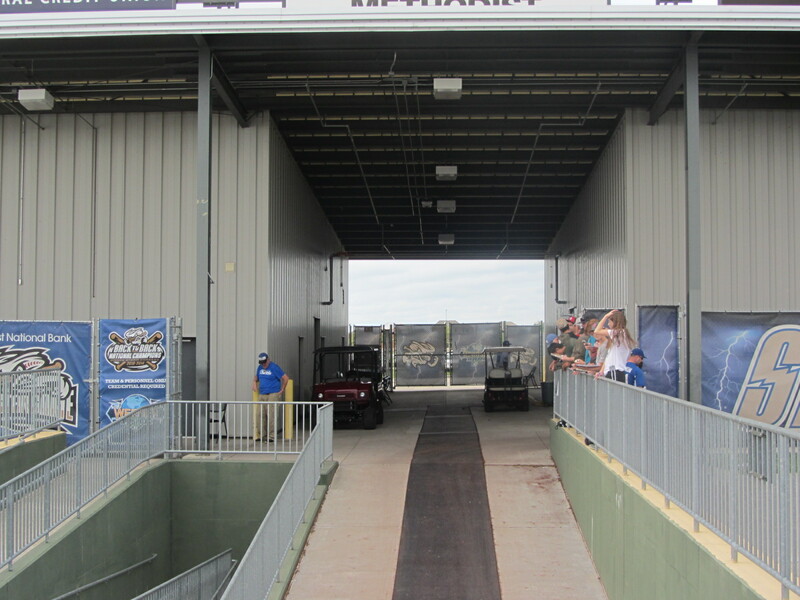 The home and visiting clubhouses are located in left field, with a ramp leading across the concourse and down onto the playing field. 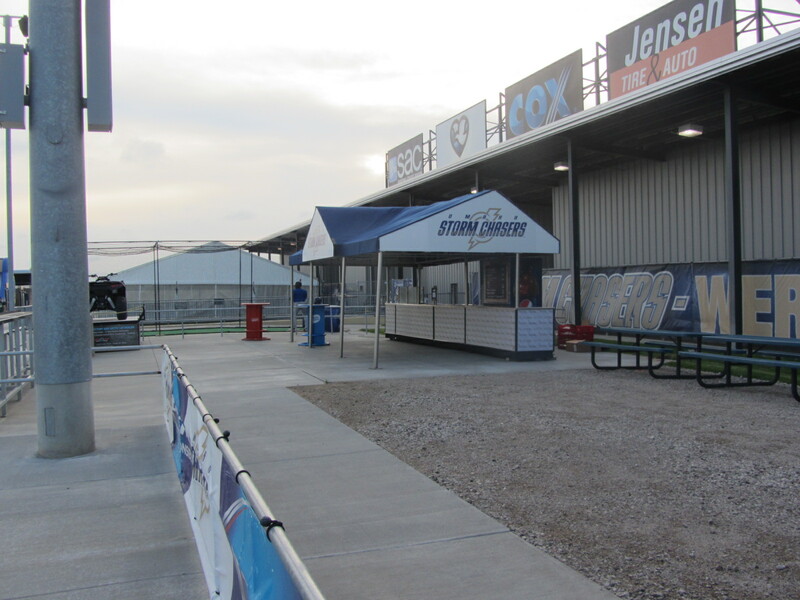 The Storm Chasers clubhouse is on the right, as in toward center field. If this random grouping of individuals doesn’t scream “Minor League Baseball” then, really, I don’t know what does. 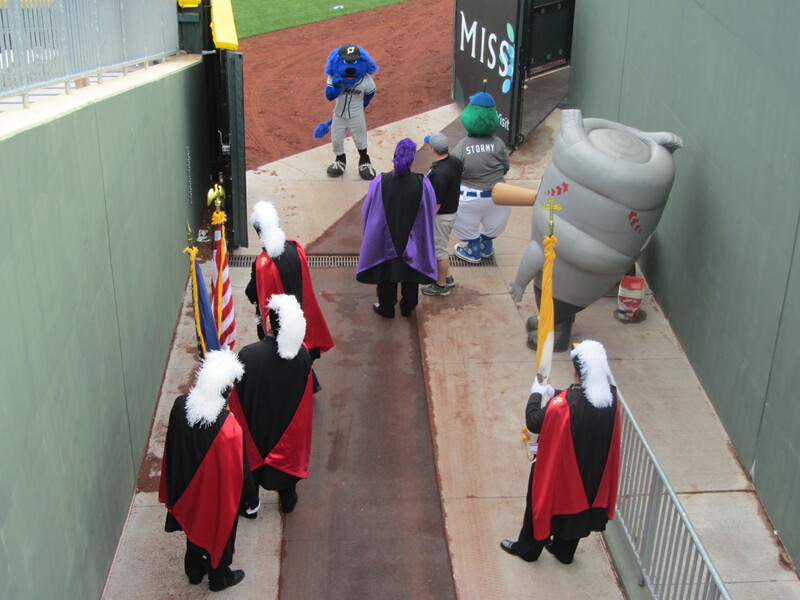 I then made my way onto the field, so that I could observe the pregame ceremonies at close range. 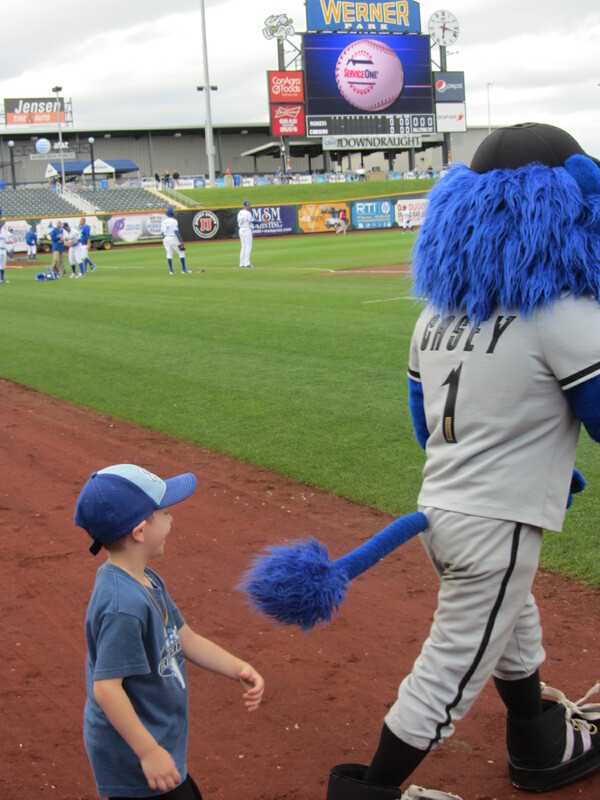 Kids love to mess with Casey’s tail. This is Stormy. He’s anemometer-ically correct. Now here’s an idea that other teams might want to steal. 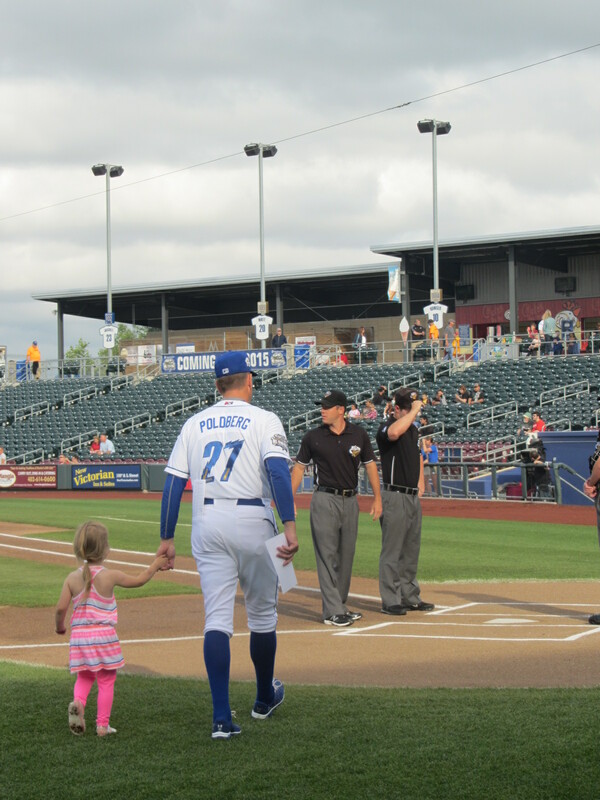 Before every Storm Chasers game, a young fan accompanies manager Brian Poldberg to home plate for the exchanging of the line-up cards. 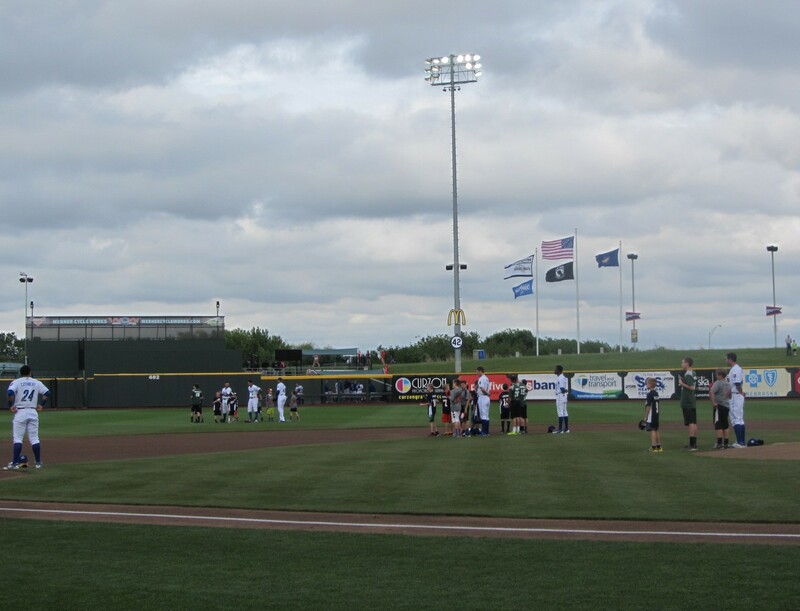 During the singing of our National Anthem, the Storm Chasers players were accompanied by a veritable gaggle of local youth athletes. And then it was time to, yes, Play Ball. 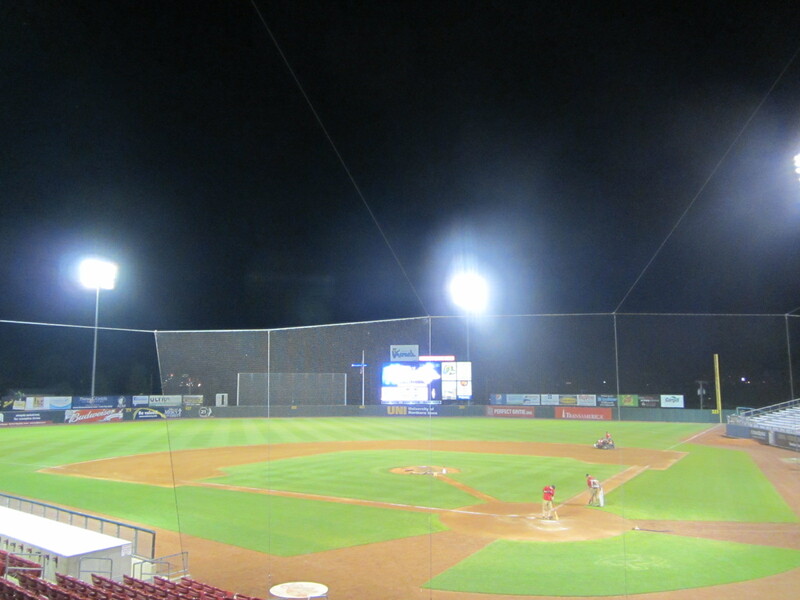 It was a gray Thursday night, decent but far from ideal conditions for baseball. 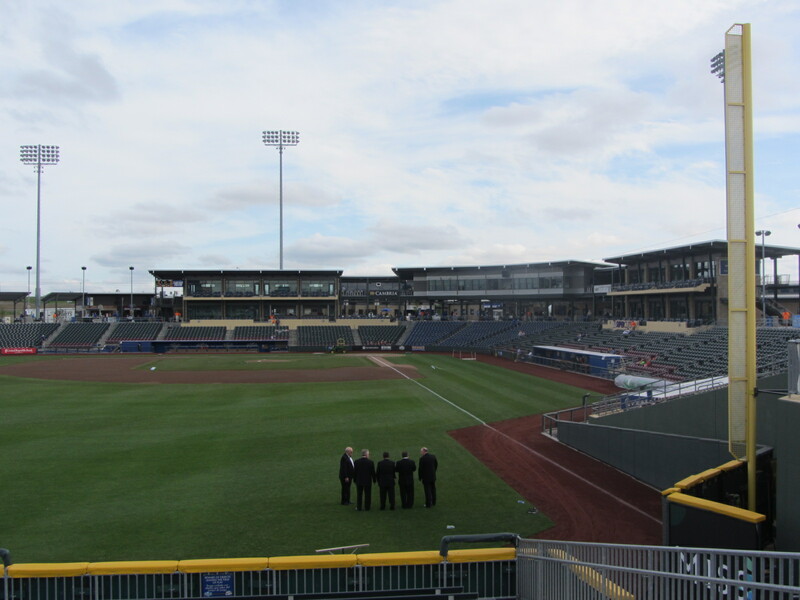 Martie told me that, the day before, the team had experienced what he deemed to be the best weather in Werner Park history. And, on top of that, the team had staged a star-studded “Salute to the Kansas City Royals” promo in honor of their long-time parent club. “You should have been here yesterday,” said Martie, echoing a sentiment that has been expressed to me by Minor League general managers across the land. But it wasn’t yesterday. It was today. In the next post of this Storm Chasers saga, I’ll cover the today that was in further detail. To see all of the posts from my May 2015 trip through the Midwest, click HERE. To see ALL of my “On the Road” posts (going back to 2010), click HERE. 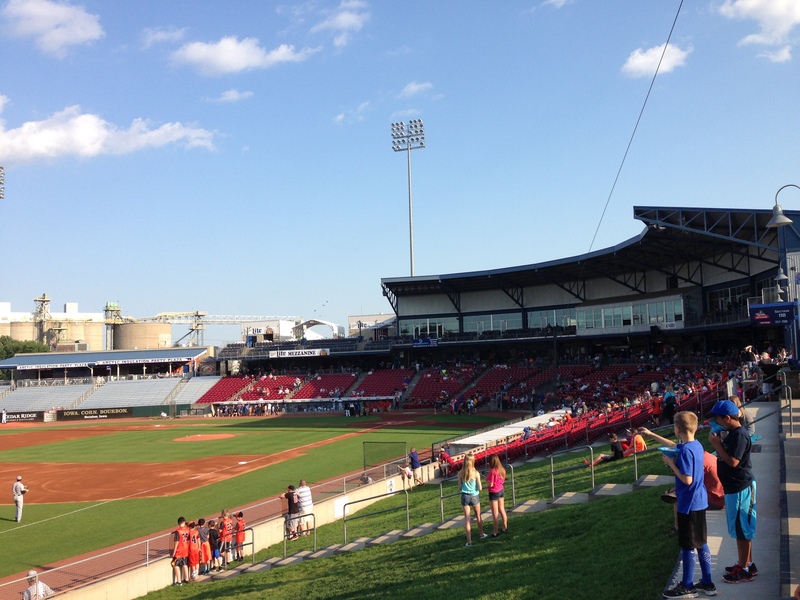 On Wednesday, May 27th, I attended a Cedar Rapids Kernels game. The next morning, I checked out of my hotel and began the westward drive toward my next destination of Omaha. 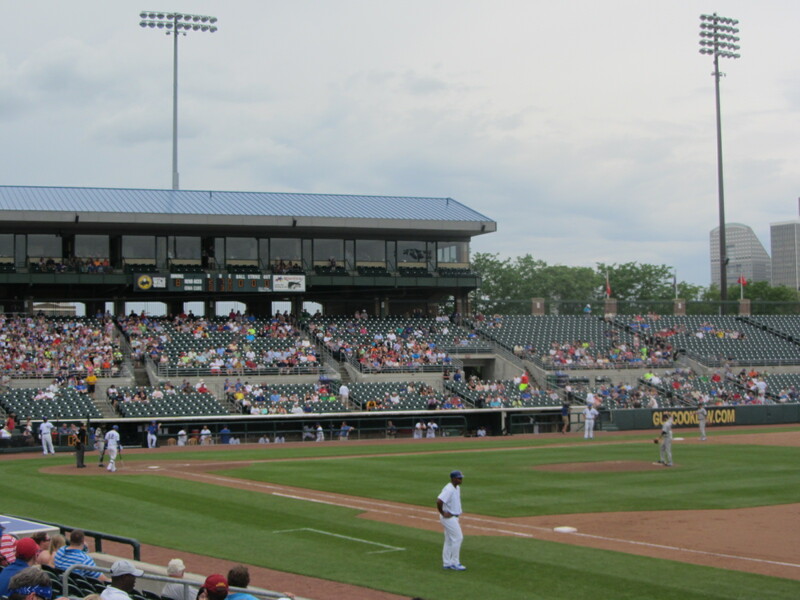 More or less midway between these two locales sits Iowa’s capitol city of Des Moines, the home of the Iowa Cubs. And, wouldn’t you know it? The Cubs were playing an afternoon game. I decided that it was my moral duty to attend. 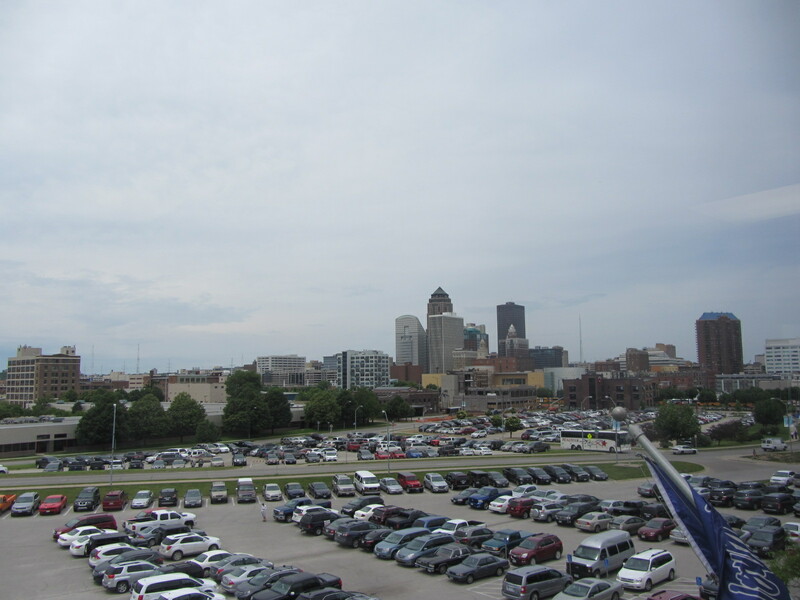 After making my way to ballpark’s upper level, I snapped this shot of downtown Des Moines in the distance. 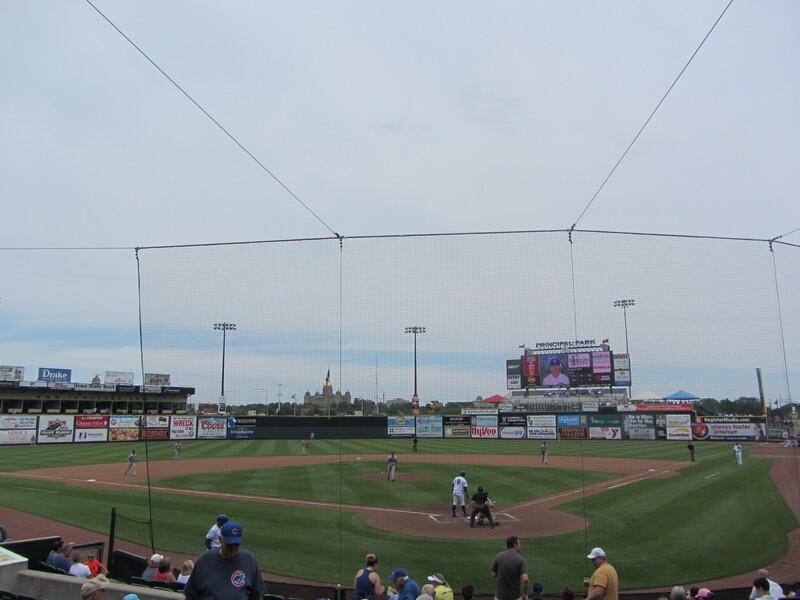 By the time I had arrived at Principal Park, the game was already in the fourth inning. My time in Des Moines was destined to be a mere cameo, as opposed to the leading roles I had become accustomed to elsewhere on this trip. 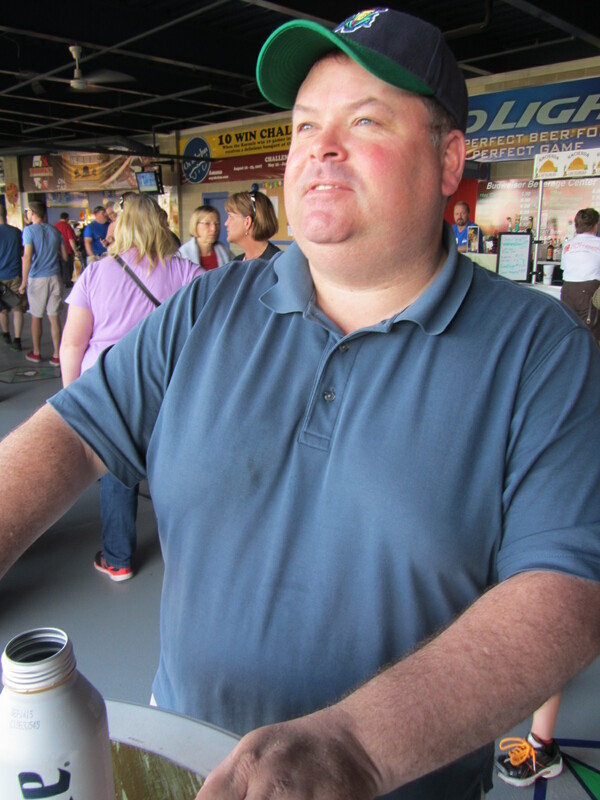 Shortly after arriving I rendezvoused with I-Cubs “director of consumer experience” Scott Sailor, a gracious guy who, true to his nature, graciously led me around the ballpark through the remainder of the ballgame. 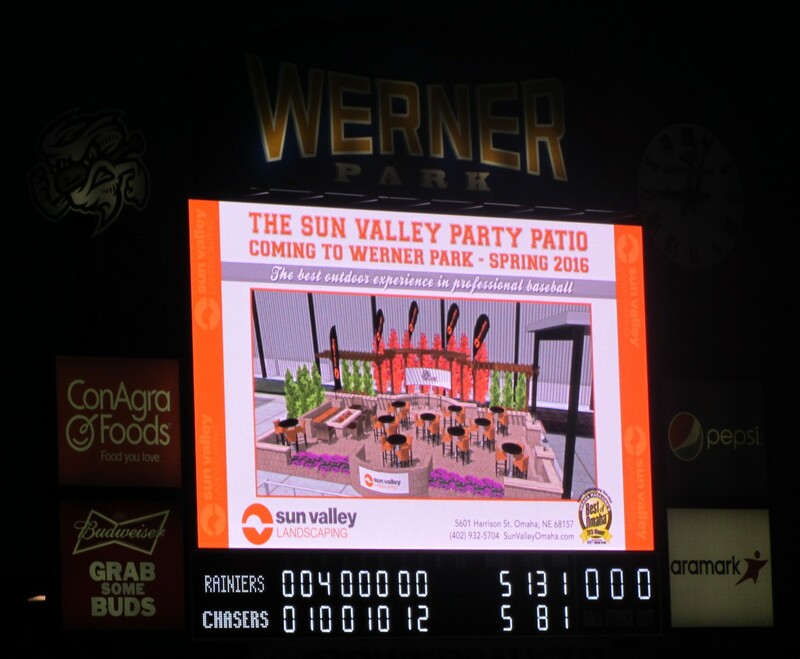 We began on the ballpark’s upper levels. 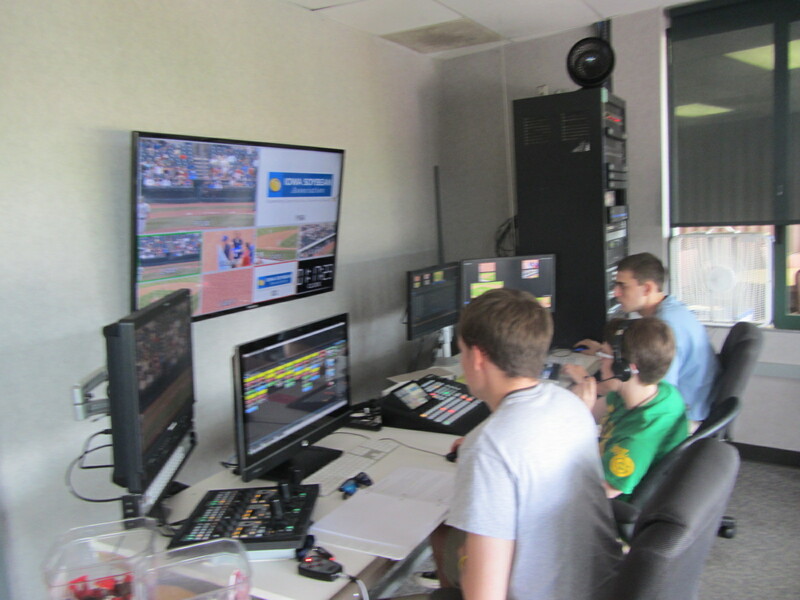 A cadre of interns were working the new videoboard. 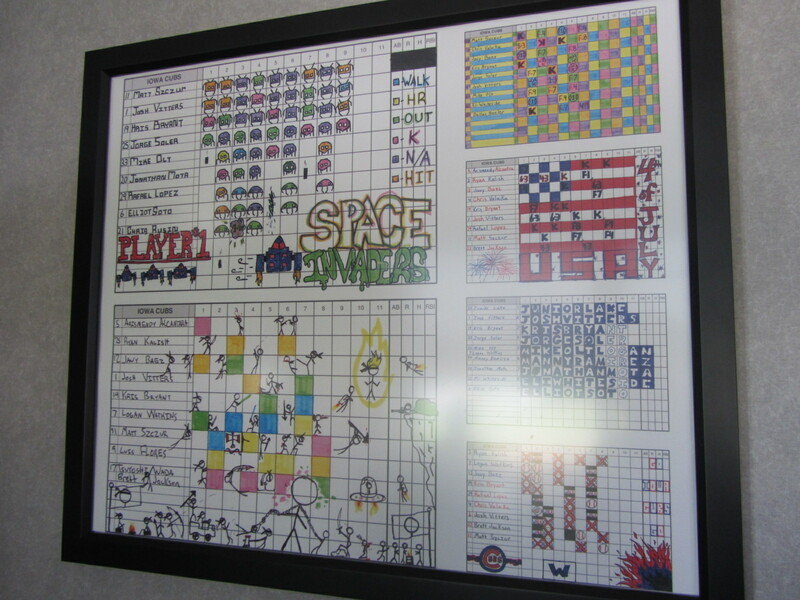 I spent some time gazing upon the graphic scorecard art of former video intern Sam Thompson. Principal Park was just the second ballpark I’ve visited this year to have a pitch clock; the first was the Baseball Grounds of Jacksonville. 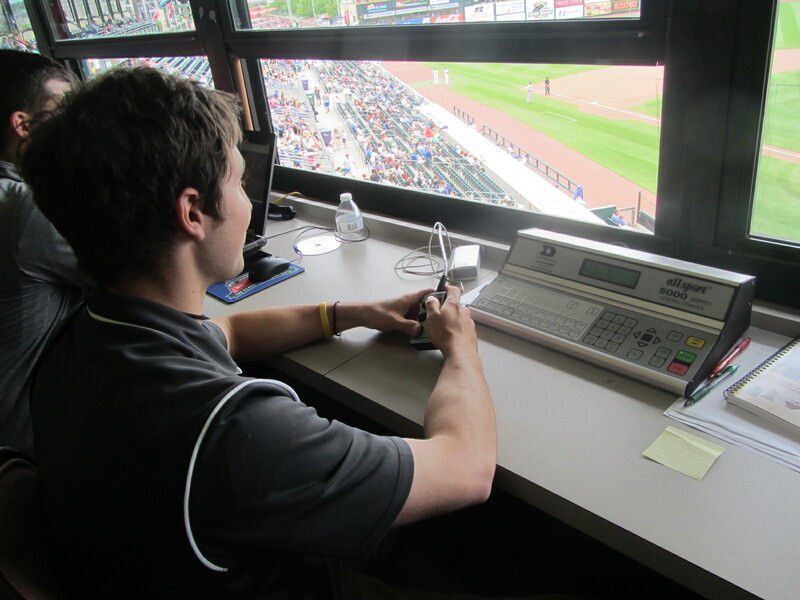 In Jacksonville the pitch clock was operated by the PA announcer via a tablet computer. Here in Iowa, media relations intern Brock Borgeson (a relief pitcher at nearby Simpson College) ran the clock through this Daktronics console. Borgeson said that the pitch clock is a work in progress, as it is for all teams at this particular juncture. Borgeson also said that the umpires often exercise discretion as to when, exactly, to start the between-inning pitch clock. 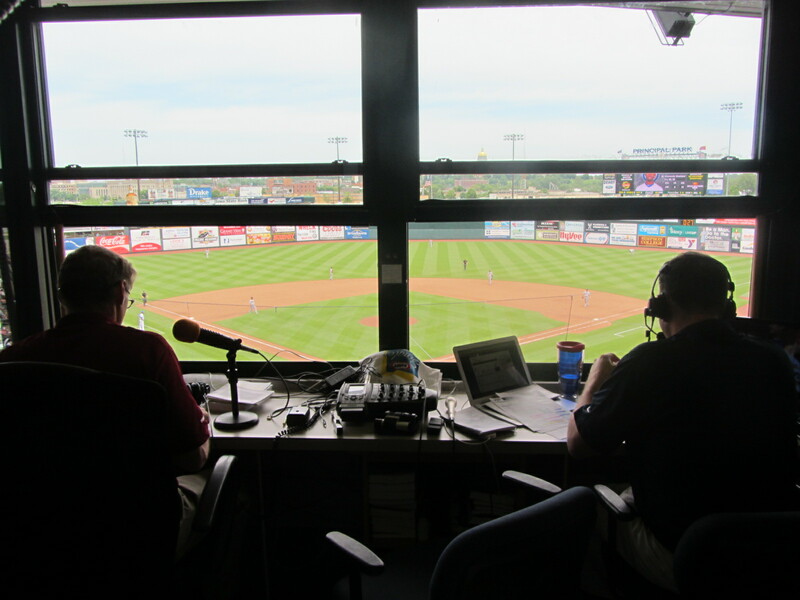 After speaking with Borgeson, it was off to to the radio booth to do an inning on the air with Deene Ehlis (left) and Randy Wehofer. Friends of this blog are of course familiar with Wehofer, who is a movie star. Scott and I then headed down to the main seating area. The ballgame, between the I-Cubs and Tacoma Rainiers, began at 1:08 p.m. and had been cruising along ever since. 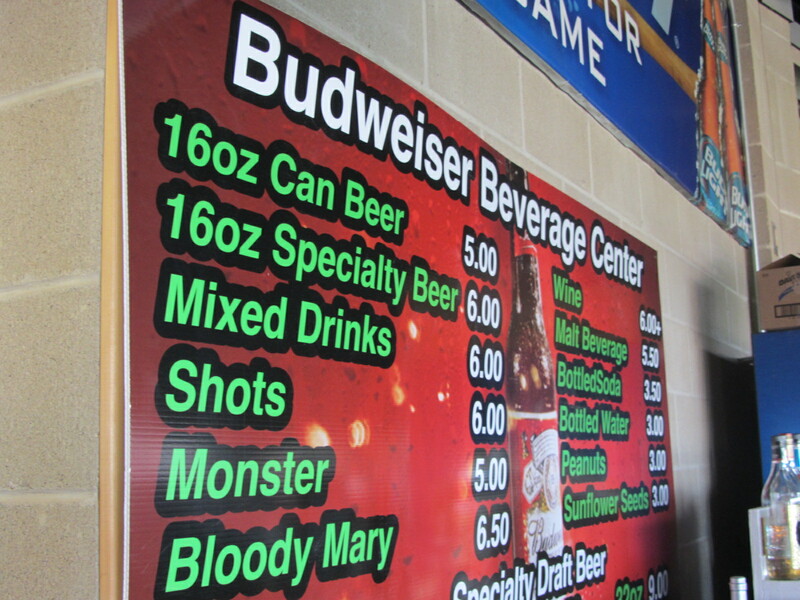 Since the last time I visited, the Cubs have increased their craft beer selection by a considerable margin. 28 craft brews were available; Peace Tree “Blonde Fatale” had the highest ABV (8.5%). 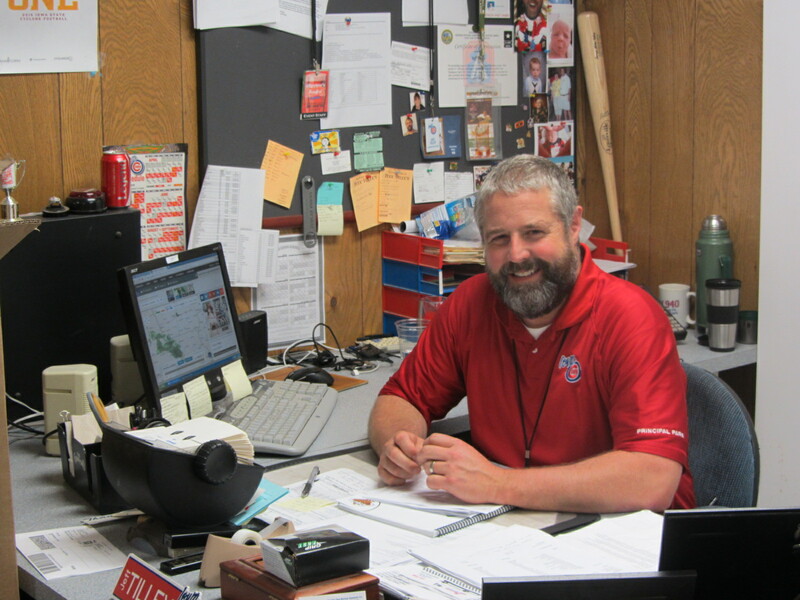 We then paid a visit to director of stadium operations Jeff Tilley, who was hard at work within his ballpark lair. Tilley coordinates travel arrangements for the team, and in the Pacific Coast League this can be a fraught process. While he’s smiling in the above photo, he probably wasn’t by the end of the day. 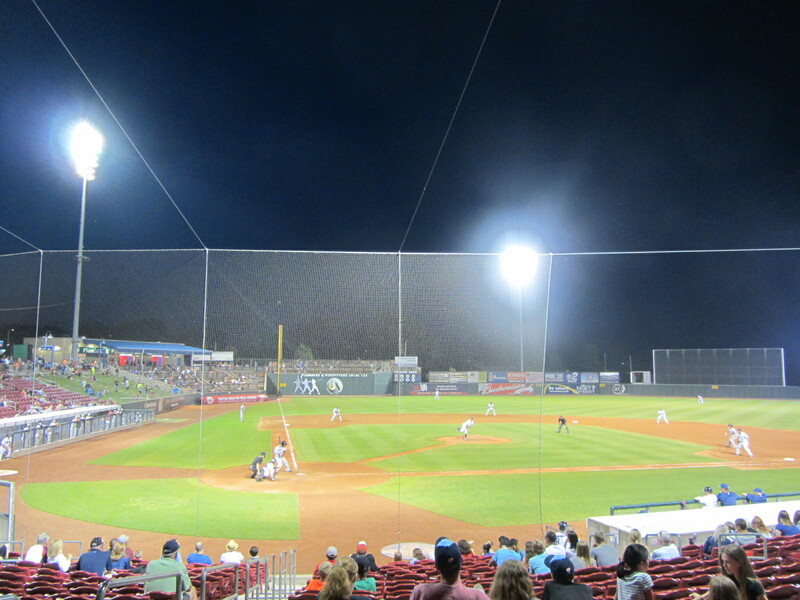 The I-Cubs post-game journey to El Paso most definitely did not go as planned — read all about it in this MiLB.com article. Did I mention that this game was flying right along? After emerging from Tilley’s lair, Scott and I found that it was already the top of the ninth inning. Brian Schlitter was coming in to pitch for the Cubs, who were losing by a score of 2-0. 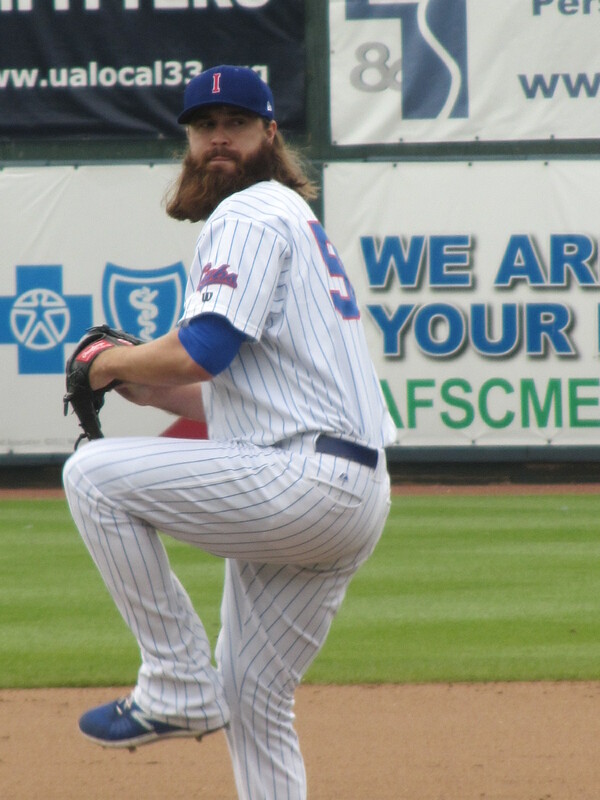 Schlitter has one of the most extreme beards in Minor League Baseball. It’s luxurious and silky. Scott and I soon moved to first row seats behind the third base dugout. I kept trying, and failing, to secure a shot of a rotating graphic which, apropos of nothing, wished me a happy birthday. Oh, well. 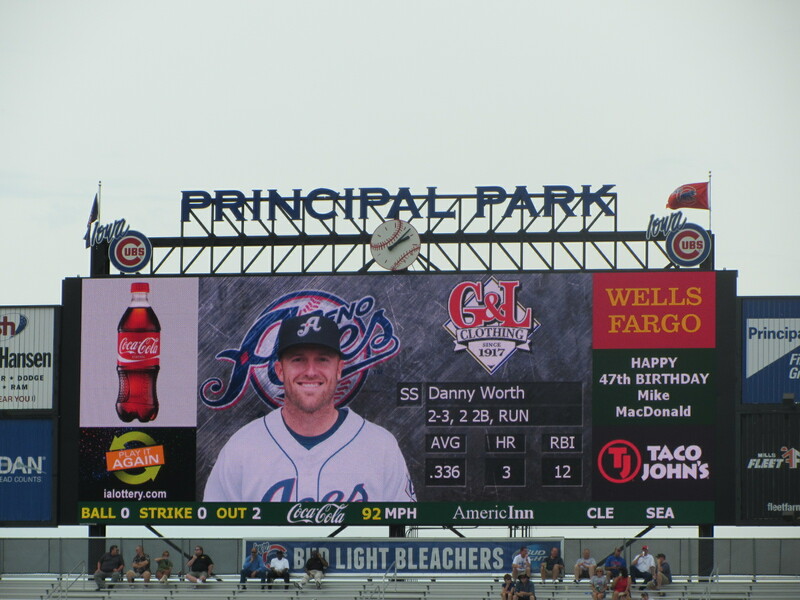 It’s a new scoreboard, and it’s very nice to look at anyway. I also had missed this fourth inning graphic, in which a plug for this blog was incorporated into a between-inning contest. Anyhow, yeah, there was a ballgame going on and this ballgame was in its waning stages. 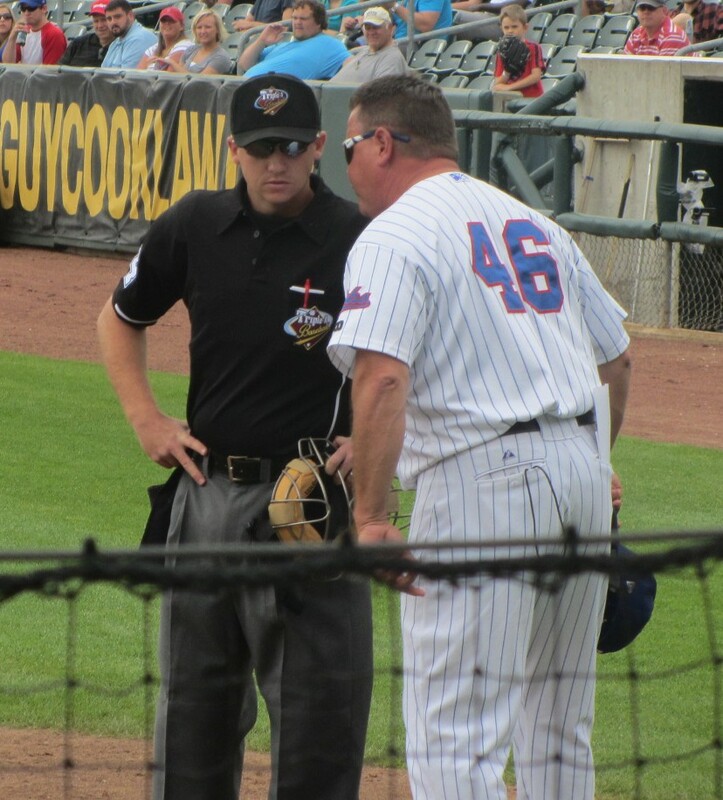 I’m not exactly sure what it was that provoked him, but at some point during the top of the ninth Cubs manager Marty Pevey came out and gave the home plate umpire a piece of his mind. He went from “perturbed” to “apoplectic” in approximately 15 seconds. Pevey’s intensely stated objections eventually led to his ejection. In the bottom of the ninth inning, Arismendy Alcantara and Adron Chambers both singled to start the frame. A light rain had just begun, and Scott suggested that we move to a dry location. We hustled up the stairs, resolving to watch the game from a protected concourse location. And wouldn’t you know it? The very first pitch that we witnessed from this location was a three-run walk-off home run off of the bat of Matt Szczur. Scott Sailor’s words had proven prophetic. 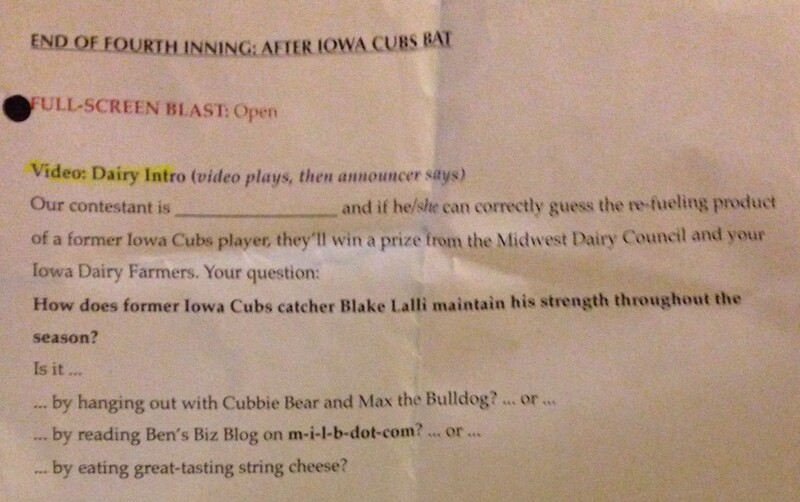 The I-Cubs won, 3-2, in a game that took a crisp two hours and 15 minutes to complete. After waiting out a brief traffic jam in the parking lot, it was on to Omaha. Life on the road, you’ve gotta love it. 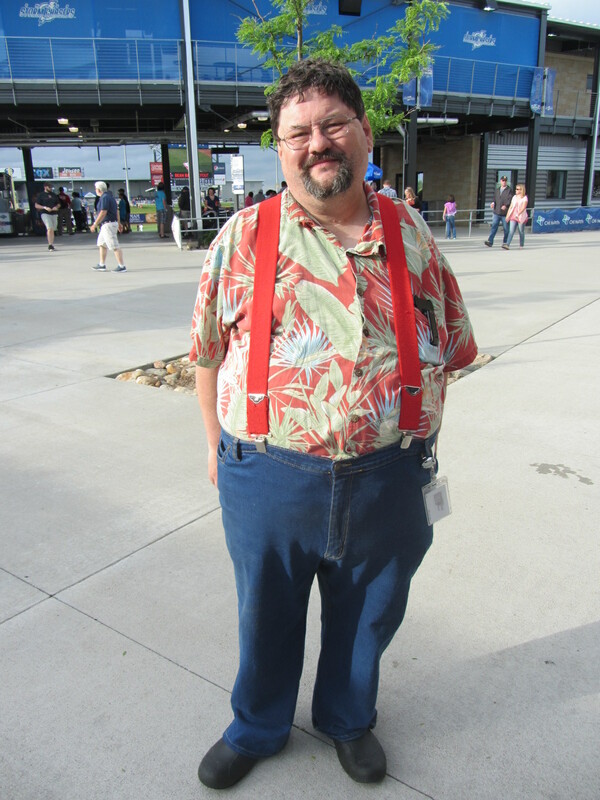 To see all of my posts from my May 27, 2015 visit to the Cedar Rapids Kernels (this is Part Three) click HERE. To see all of the posts from my May 2015 trip through the Midwest, click HERE. To see ALL of my “On the Road” posts (going back to 2010), click HERE. May 27, 2015, was to be a very special day for Tim. 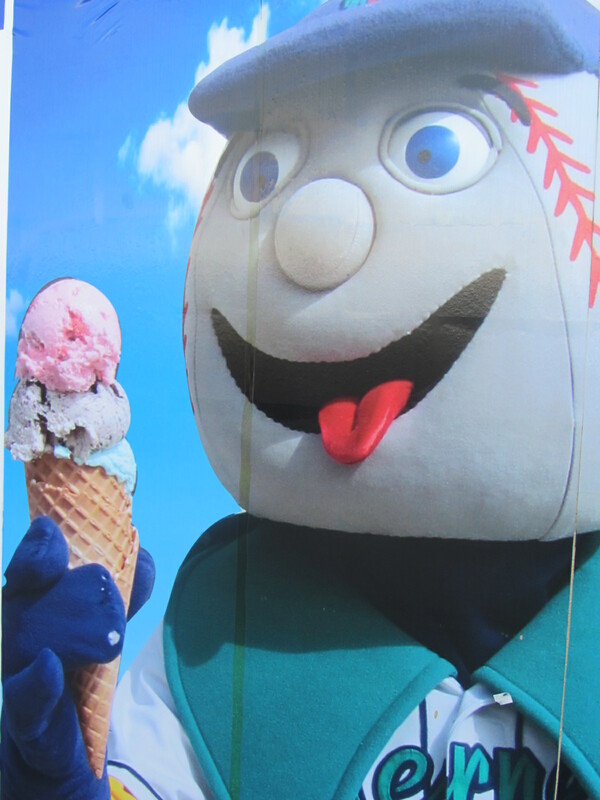 For on May 27, 2015, he visited the Cedar Rapids Kernels and served as my Designated Eater (you know, the individual who consumes the ballpark cuisine that my gluten-free diet prohibits). Tim, a Indianapolis native who now lives in Chicago, is very familiar with the Minor League scene. 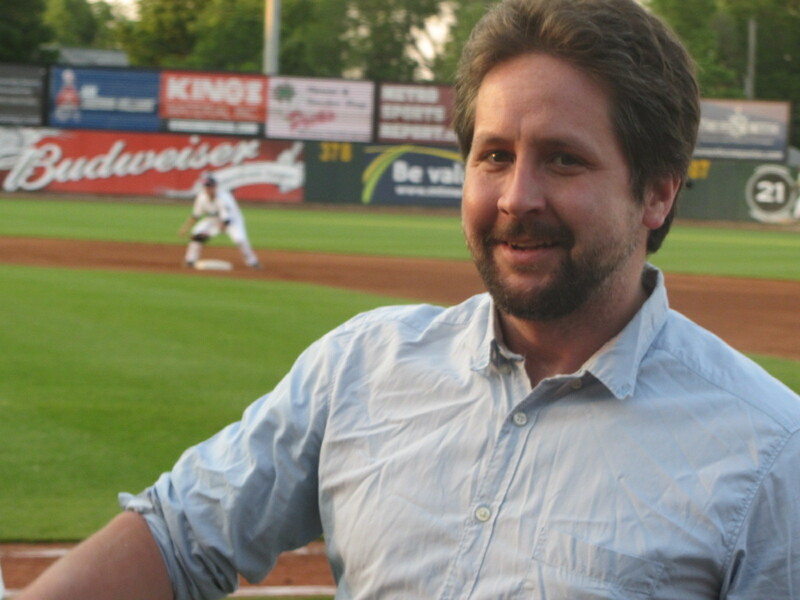 In addition to owning his own production company, Park Walk Productions, he the author of the (recommended) Baseball Road Trips: Midwest and the Great Lakes. Tim wasted no time in getting down to business. 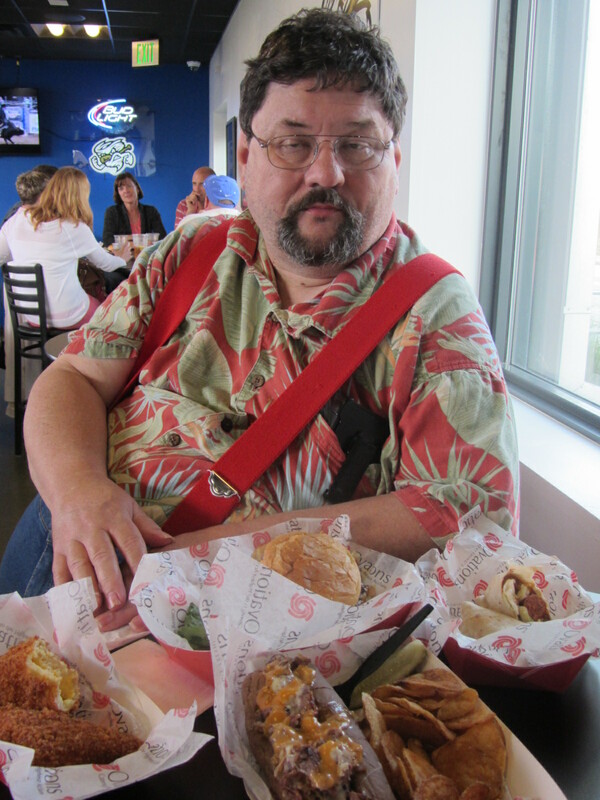 When I met him on the concourse at the start of the game, he had already procured this pork tenderloin sandwich. The Pork Tenderloin is, quite literally, bigger than Tim’s head. It is bigger than just about any human’s head, unless that human happened to have a cranium of Bochyian proportions. When put up against Tim, the pork tenderloin offered little resistance. However, as great as the Kernels’ pork tenderloin was, Tim said it wasn’t the best he’d ever had. He bestowed that honor upon the Bourbon Street Distillery in Indianapolis, instead. “But I’m getting toward 50, so I have to phase [Pork Tenderloin Sandwiches] out of my life,” he said. “Whoa, you don’t look 50,” I replied. As for me, Ben’s Biz, I’m a lone wolf. I don’t have anyone to pull me out of trouble. I must look out for myself. 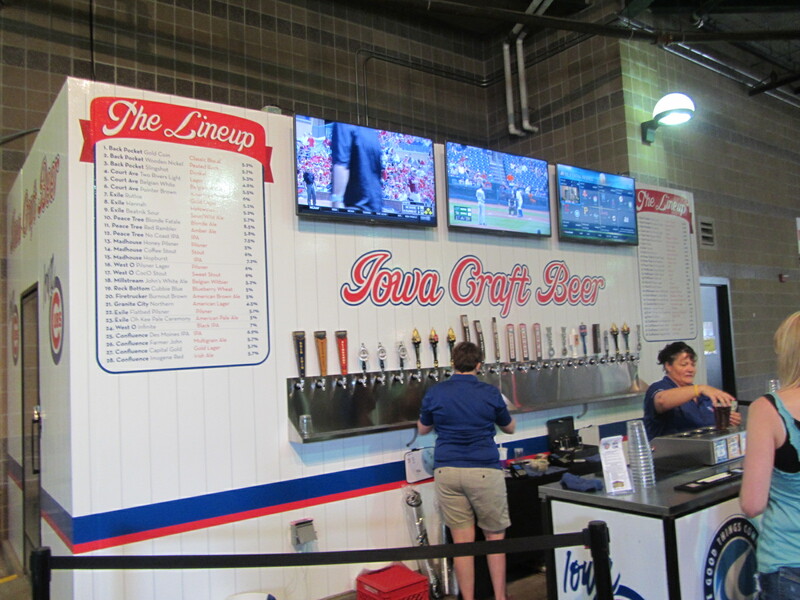 But I didn’t even need to look out for myself while in Cedar Rapids, as the Kernels were already looking out for me via a substantial slate of gluten-free items on the concession menu. Excuse the quality of this photograph. It’s the thought that counts. 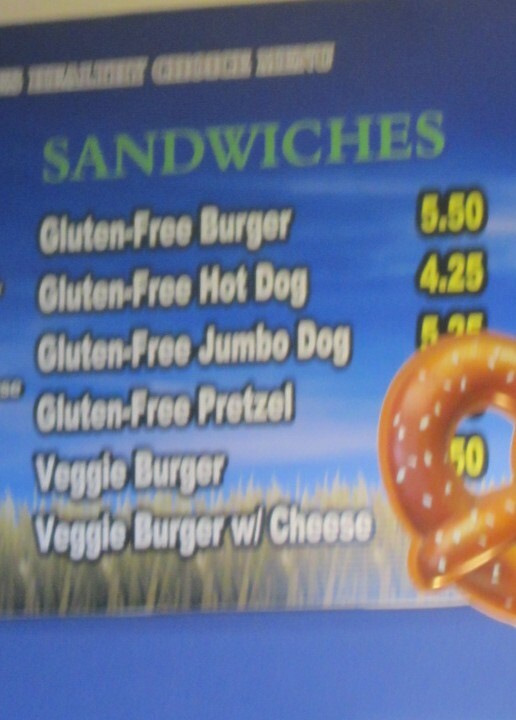 I opted for a gluten-free jumbo dog, which was delicious. 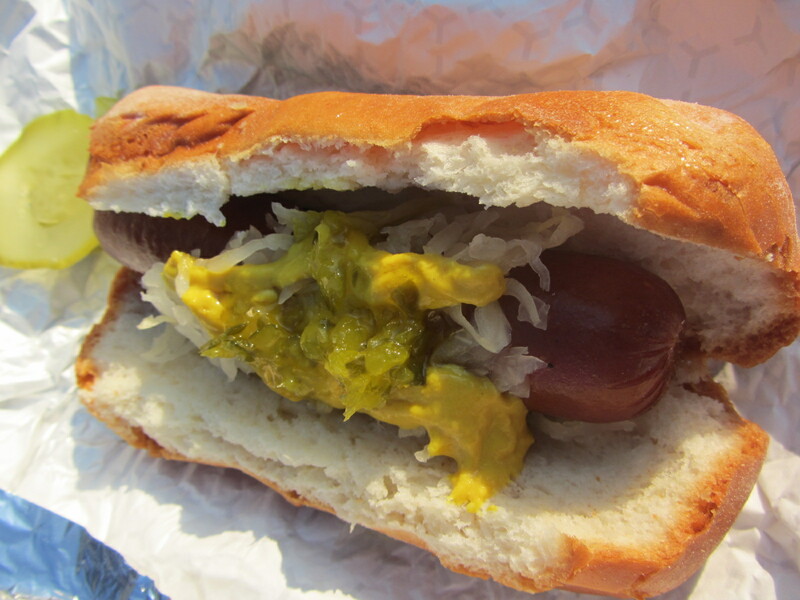 The bun had a great consistency, melded well with the dog and (the ultimate test for a GF bun), did’t fall apart. (I need to look into what brand of bun this was. I somehow seemed to have neglected this crucial bit of information.) Who needs a designated eater? But, don’t worry, I haven’t forgotten about Tim. 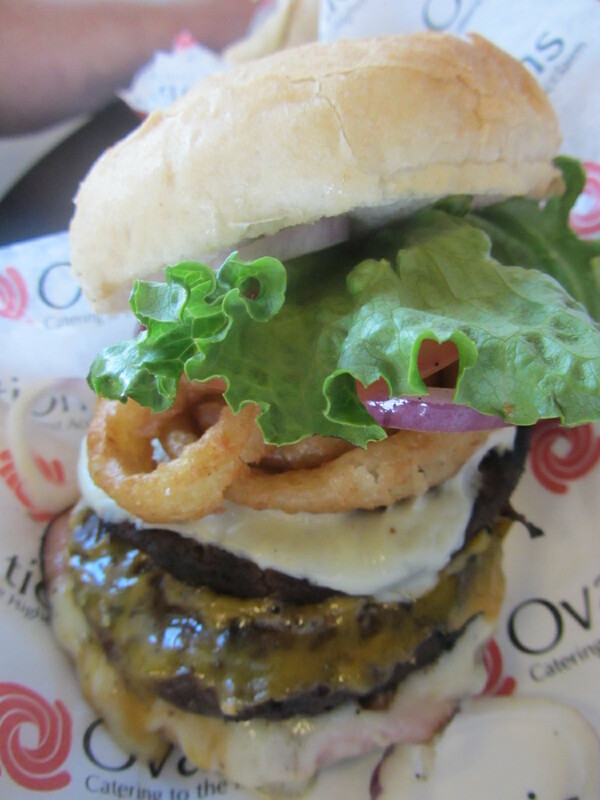 Our next stop was this riotous build-your-own burger and hot dog stand. 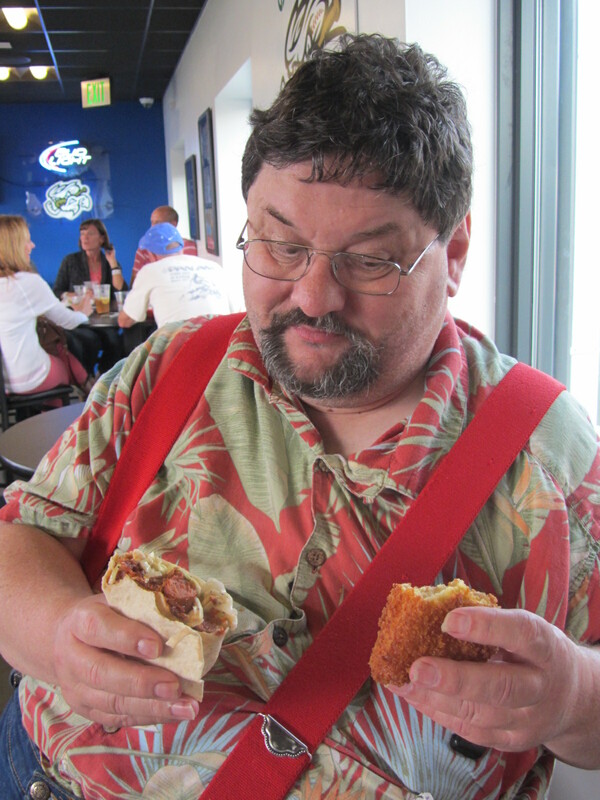 Tim, after careful consideration of all the options, ordered what was, in essence a foot-long hot dog BLT. He looked rather professorial after putting on his glasses. 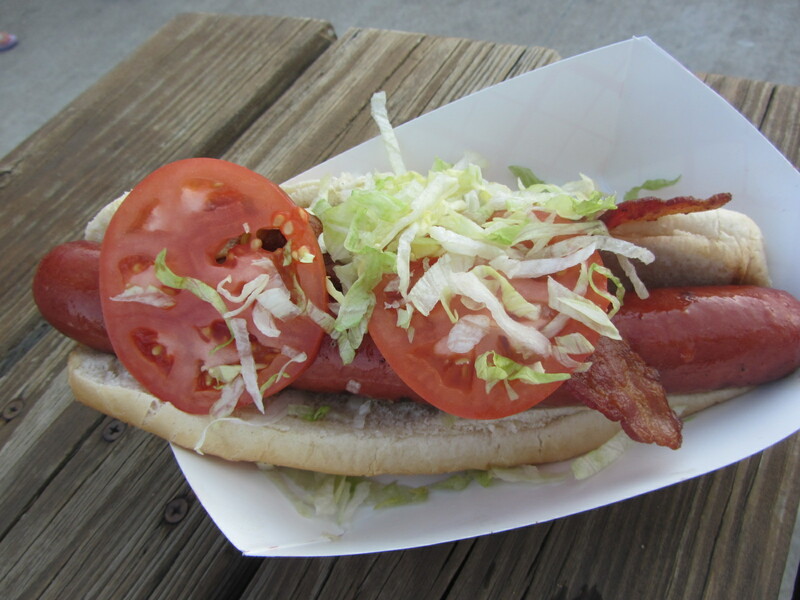 And that’s where we say goodbye to Tim, as he eats his foot-long frankfurter BLT. As unhealthy as the evening may have been, Tim had no regrets. 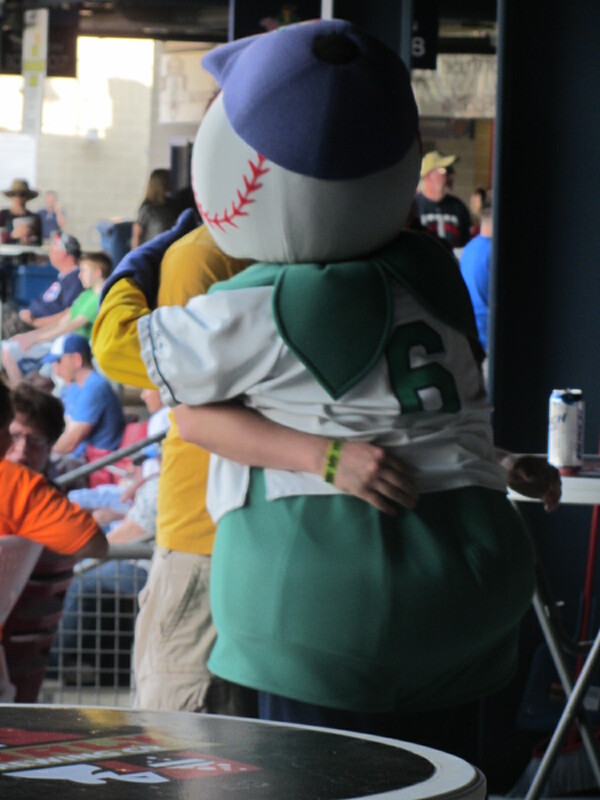 To see all of my posts from my May 27, 2015 visit to the Cedar Rapids Kernels (this is Part Two) click HERE. To see all of the posts from my May 2015 trip through the Midwest, click HERE. To see ALL of my “On the Road” posts (going back to 2010), click HERE. 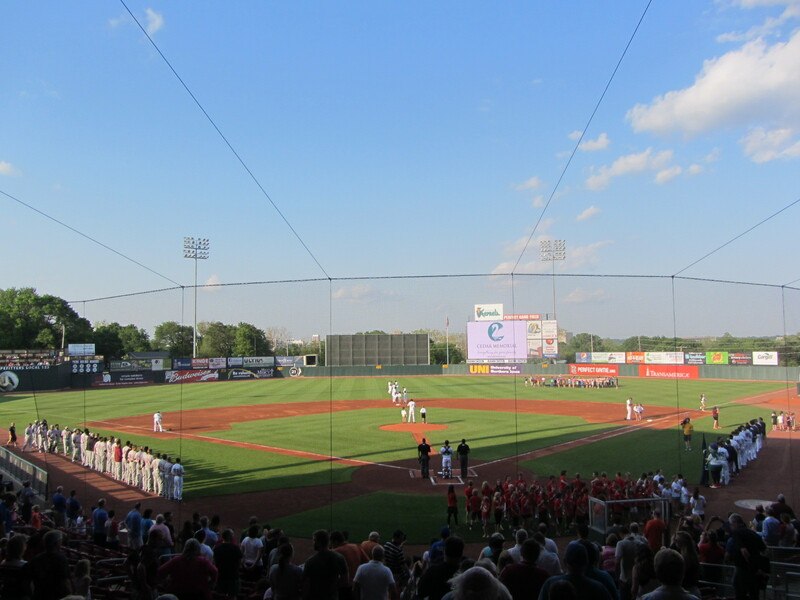 When the previous post in this series had concluded, a ballgame had just begun in Cedar Rapids. 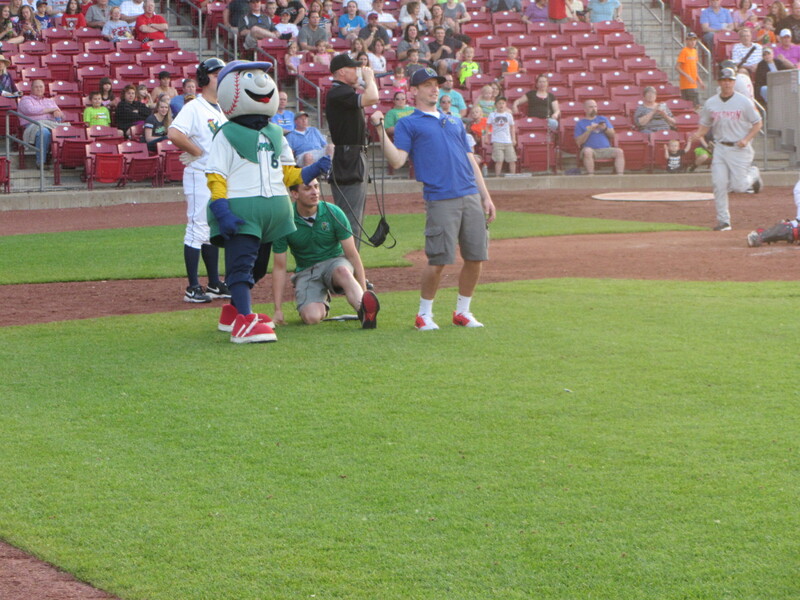 Mr. Shucks, Kernels mascot extraordinaire, was overjoyed at the sight of players on the field. He always is. 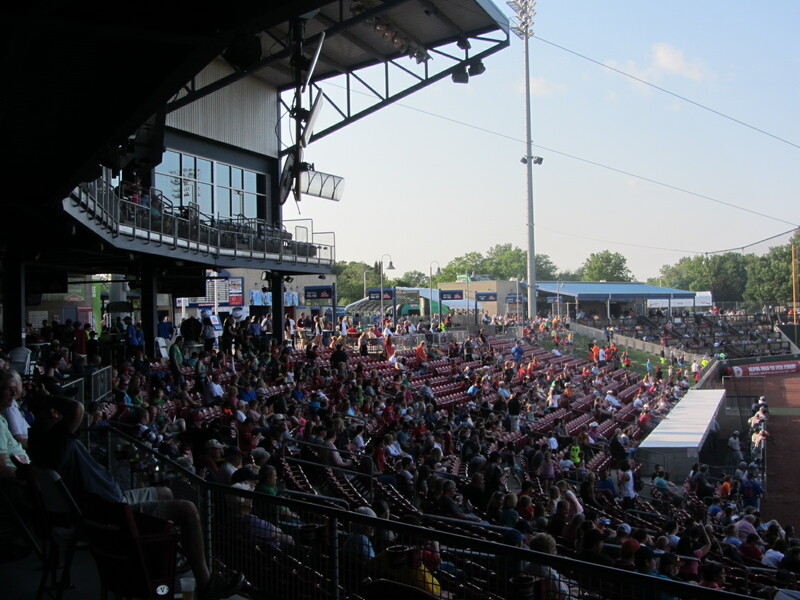 A fairly decent crowd had filed in, by Wednesday in May standards, to watch the Kernels take on the fearsome Wisconsin Timber Rattlers. 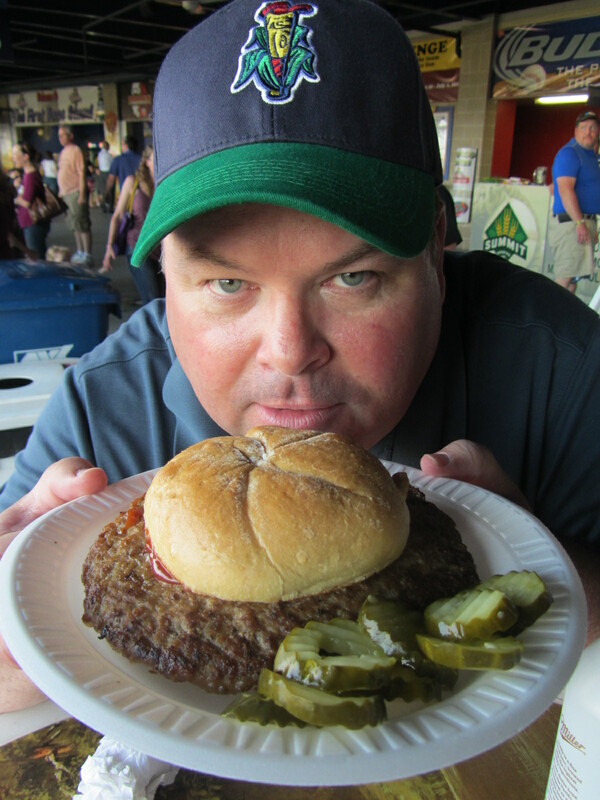 I spent the first several innings of the game with one Tim Mullin, who served as my “designated eater.” We’ll get to Tim in a separate post, but here’s a sneak peak of who we’ll be dealing with. After parting ways with Mr. Mullin, I was led down to a clandestine field-level area with an interesting view of the action. While in this area, I came face to face with the immortal Mr. Shucks. 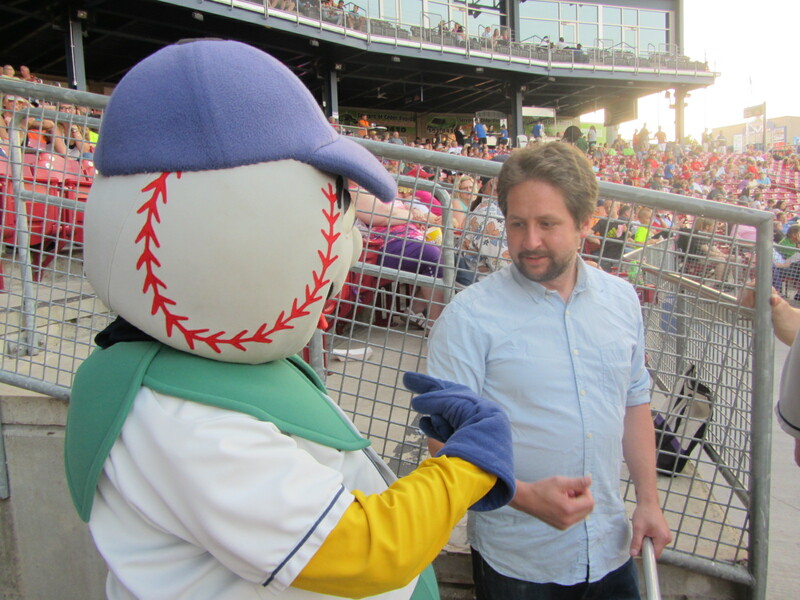 Meeting Mr. Shucks provided me with the opportunity to work on my “I, too, am a mascot” face. 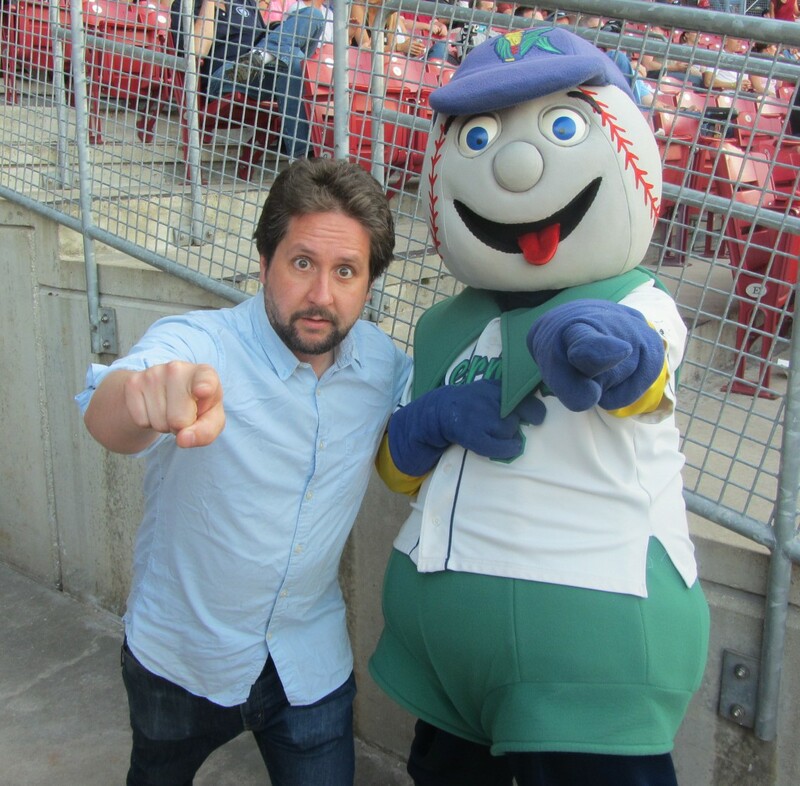 But I wasn’t in this ballpark location for mascot shenanigans alone. Of course not. That would be ridiculous. For I was to be a contestant in the nightly “Fish Fling” contest. The Fish Fling is pretty simple. 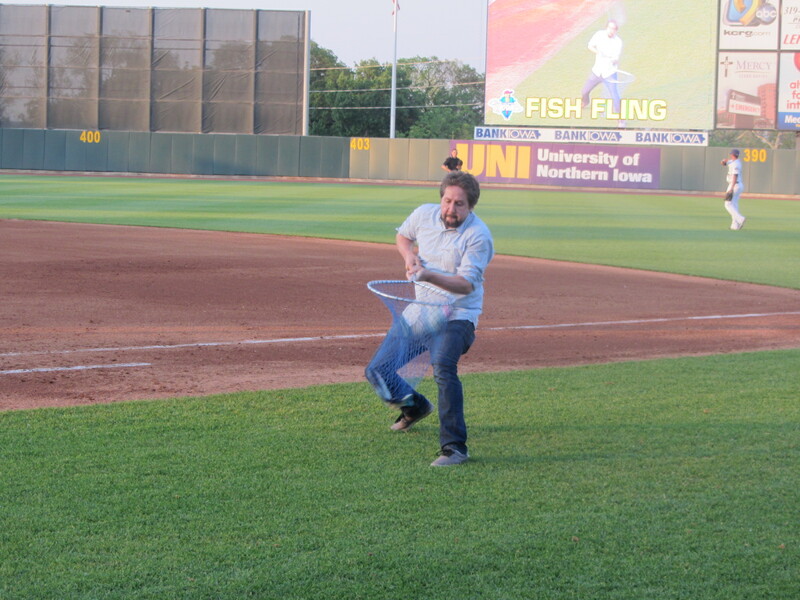 I, as the contestant, would hold the net, and the fish would then be “flung” in my general direction via a slingshot. I was told that if I caught three fish in a row I’d become the inaugural member of the Fish Fling Hall of Fame, and that no one had yet earned these aquatic accolades because this game is harder than it looks. The fish, when in the air, vacillate wildly like the fish out of water that they are. Their aerial path from slingshot to net is unpredictable at best. My camera and phone were handed off to members of the Kernel promo team, who amused themselves accordingly. Mr. Shucks gave me some last minute pointers. And then it was time to meet my Fish Fling destiny. This might sound ridiculous, but I really (really, really) wanted to get into the Fish Fling Hall of Fame and I took my participation in this contest very seriously. And things only got more intense from there. Let’s go to the tape. A defeated man in a wrinkled shirt, making the best of a deeply disappointing situation. Alright, enough with the self-aggrandizement cloaked in a disingenuous shroud of humility. Let’s move on. 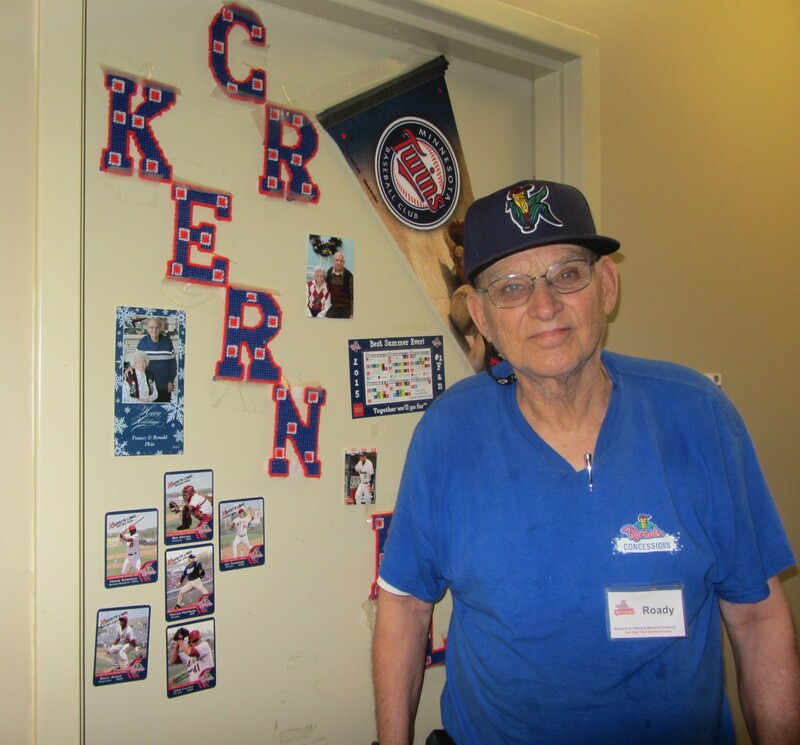 My next stop was the Cedar Rapids Kernels’ clubhouse, which is inhabited (literally) by legendary 71-year-old clubhouse manager Ron “Roady” Plein. 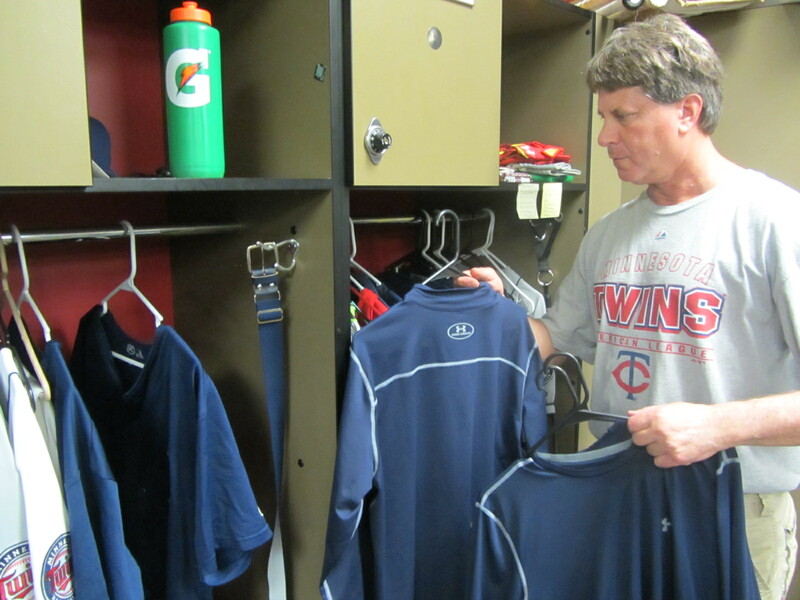 Here’s Roady standing in front of his in-stadium apartment, which is located directly next to the laundry room. 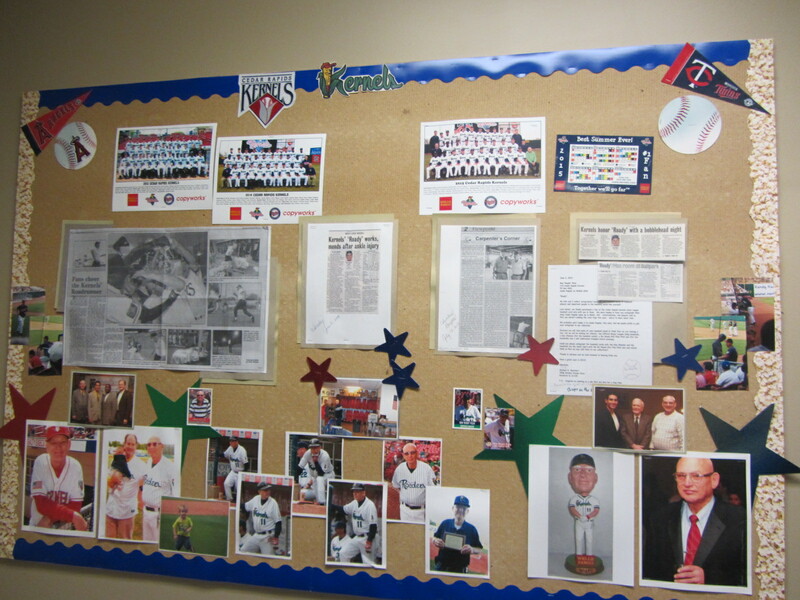 And here’s Roady’s bulletin board, at the end of the hallway, showcasing many of his career highlights. 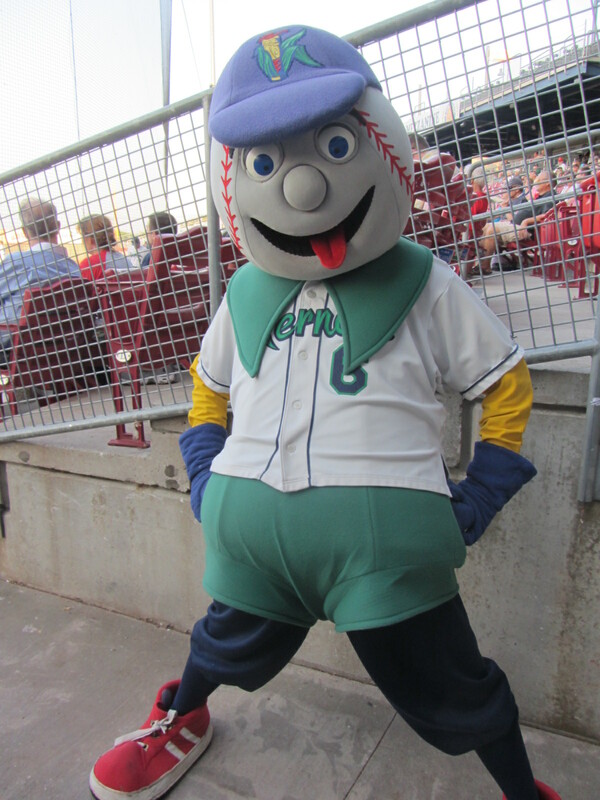 For the full-lowdown on Roady, please refer to my MiLB.com story. This story also includes the perspective of Roady’s “protege,” 56-year-old clubhouse managing rookie Eric Oliver. 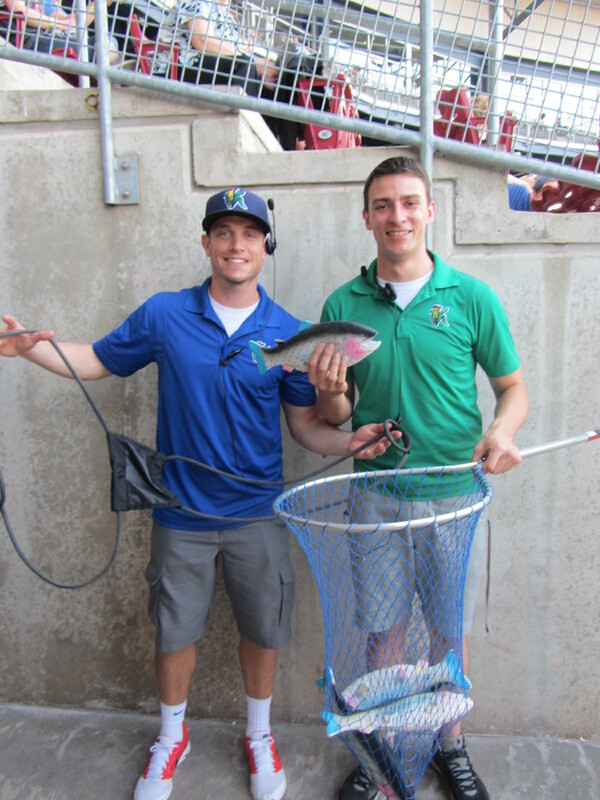 While I was in the home clubhouse, each of the two Kernels players who passed through immediately identified me as “The Fish Guy” and remarked how entertaining my on-field failure had been to those in the dugout. Guess that’s gotta count for something. 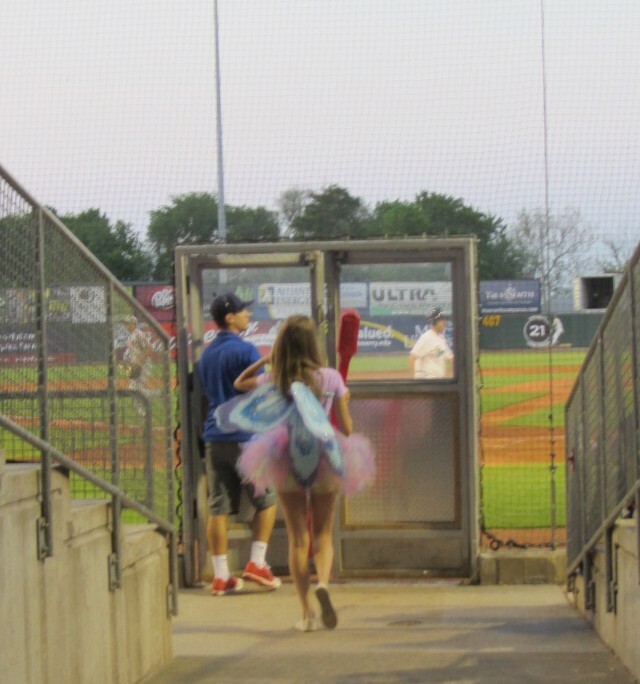 Anyhow, after exiting the clubhouse the first thing that I saw was the Tooth Fairy. Just another night in Minor League Baseball. 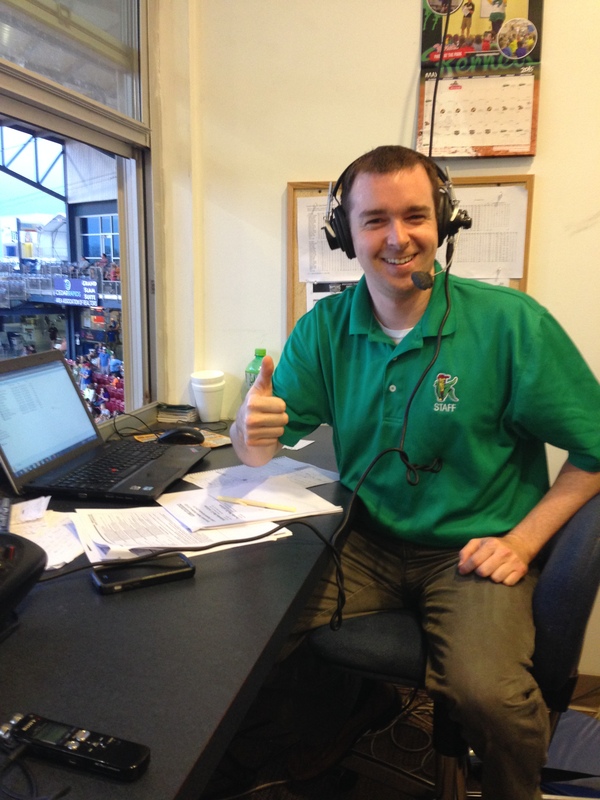 Taking inspiration from the Tooth Fairy, I then fluttered up to the press box and did an interview with Kernels broadcaster Morgan Hawk. Welcome to the Hawk’s Nest. While in the Hawk’s Nest, I came face to face with the “Roady” bobblehead. 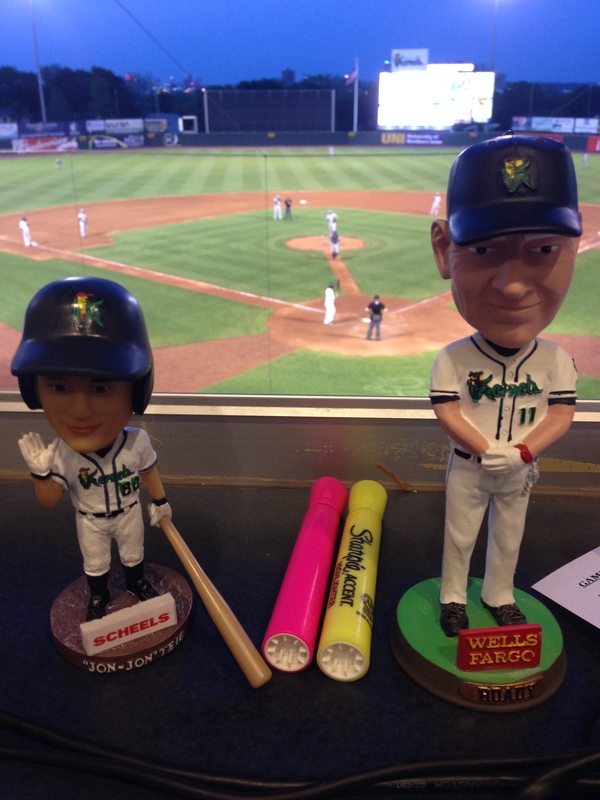 Roady’s on the right, while on the left is a bobblehead honoring long-time bat boy “Jon-Jon” Teig. 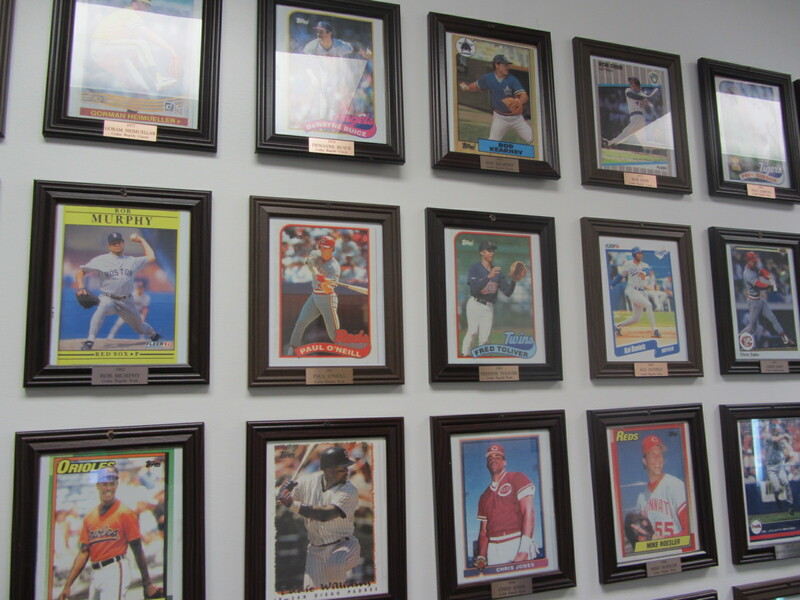 In the press box, the Kernels honor their Major League alumni in just about the coolest way I’ve ever seen: with framed jumbo-sized baseball cards. 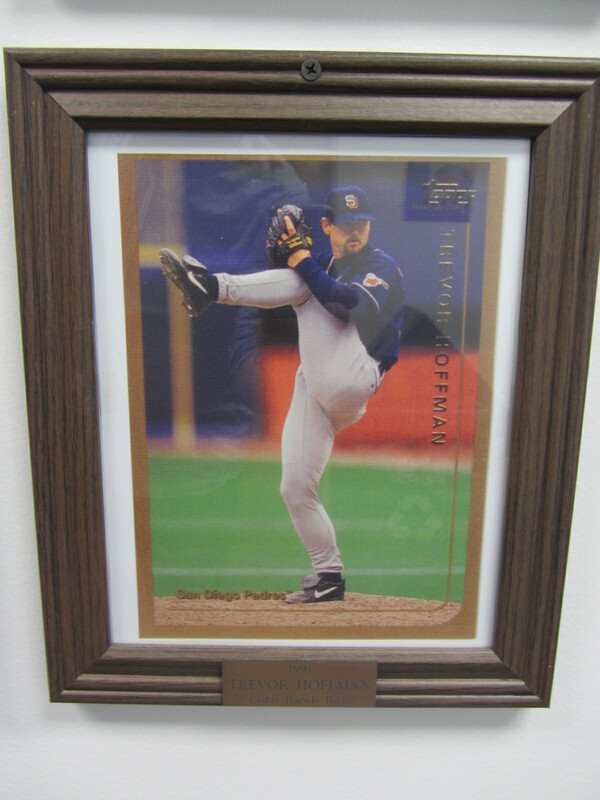 Fun fact: While playing in Cedar Rapids, Trevor Hoffman made the decision to convert from infielder to pitcher. That ended up working out pretty well for him. It was that kind of night. Nothing much left to do but make a groundbreaking and subversive joke. 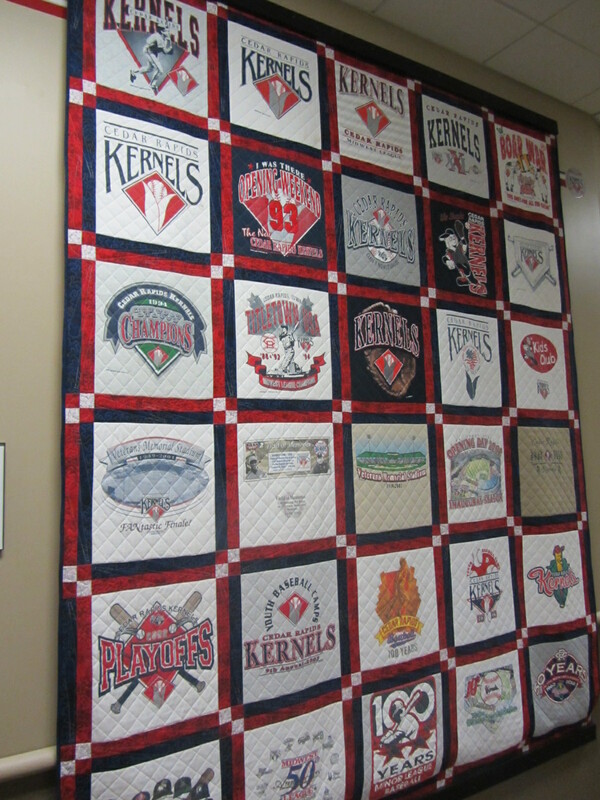 Further hallway explorations revealed this “Kernels Quilt,” designed by JoAnn Nelson (wife of former general manager Doug Nelson) and stitched by Jeannie Ellers of Guttenberg, Iowa. Time, it does not stop when I’m the midst of these baseball wanderings. A game was going on and in fact had been going on the whole time. 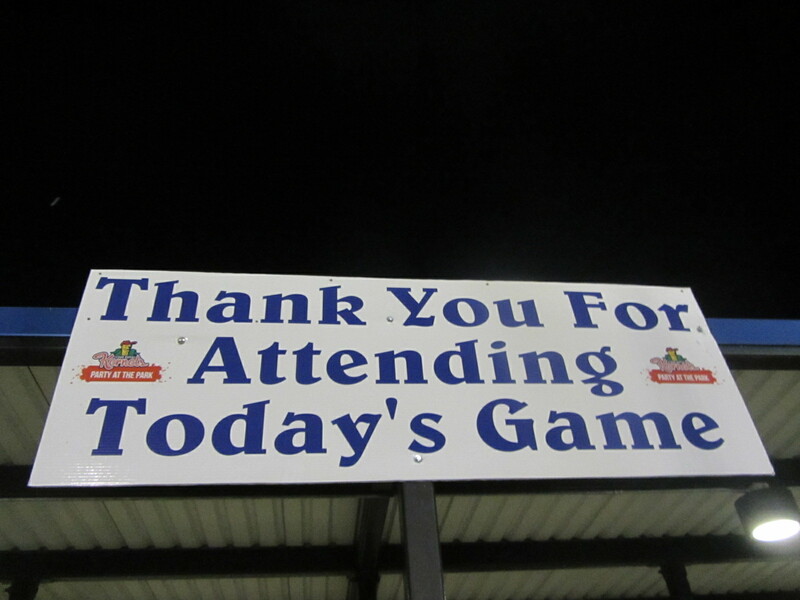 But not for long, as the Kernels won by a score of 7-3. 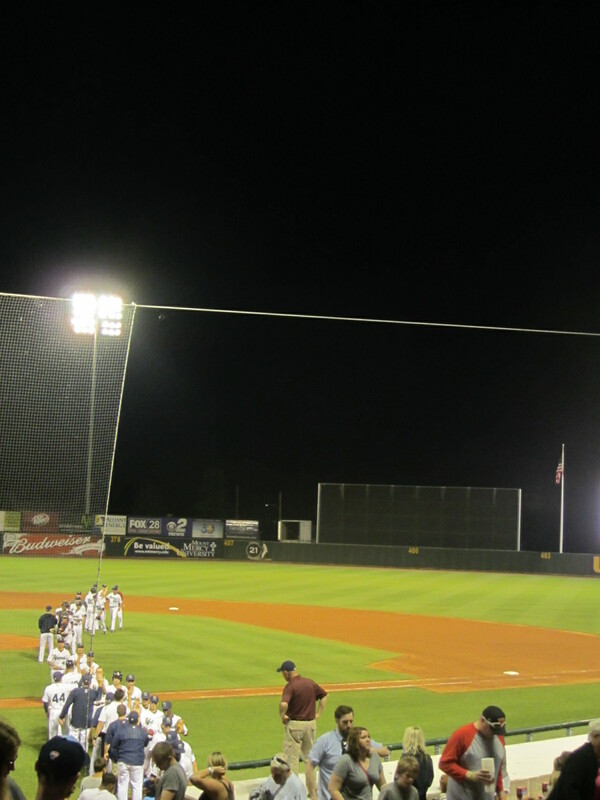 After securing victory, they mocked the visiting Timber Rattlers by forming a snake-like handshake line back into the dugout. And then, just like that, everybody disappeared. That it was it for the evening. But, really, there’s no need to thank me. It was my pleasure. 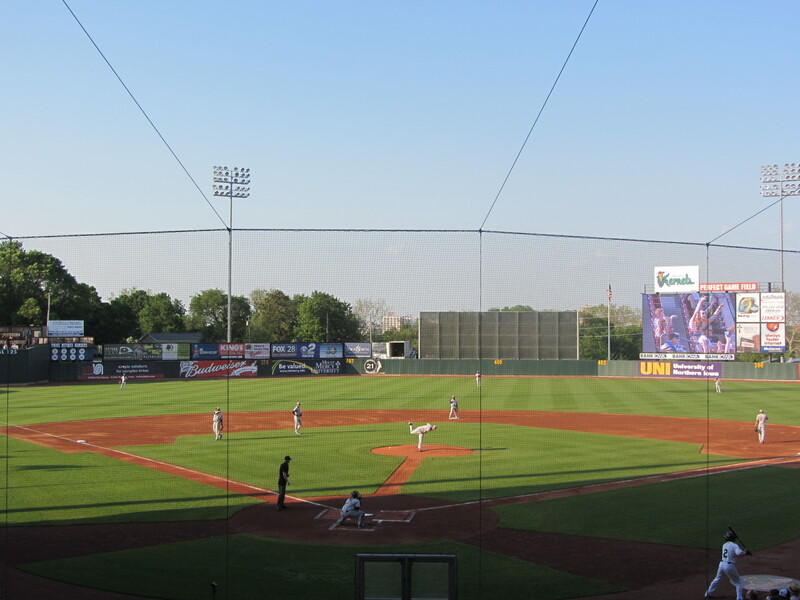 To see all of my posts from my May 27, 2015 visit to the Cedar Rapids Kernels (this is Part One) click HERE. 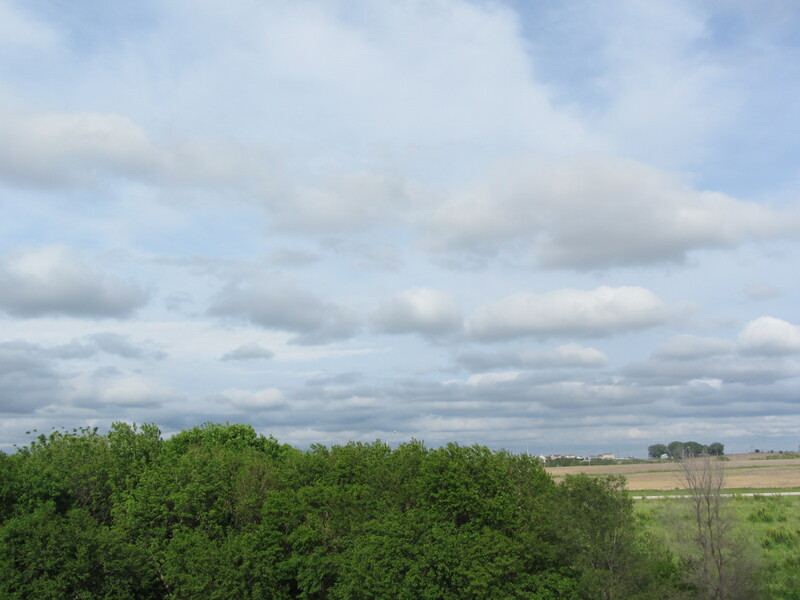 To see all of the posts from my May 2015 trip through the Midwest, click HERE. To see ALL of my “On the Road” posts (going back to 2010), click HERE. 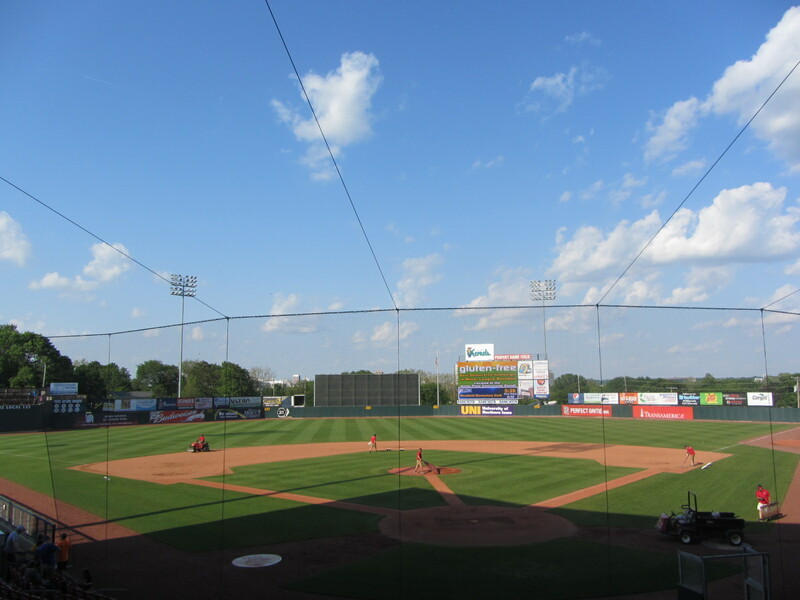 The penultimate stop of my second road trip of the season was Cedar Rapids, home of the Kernels. 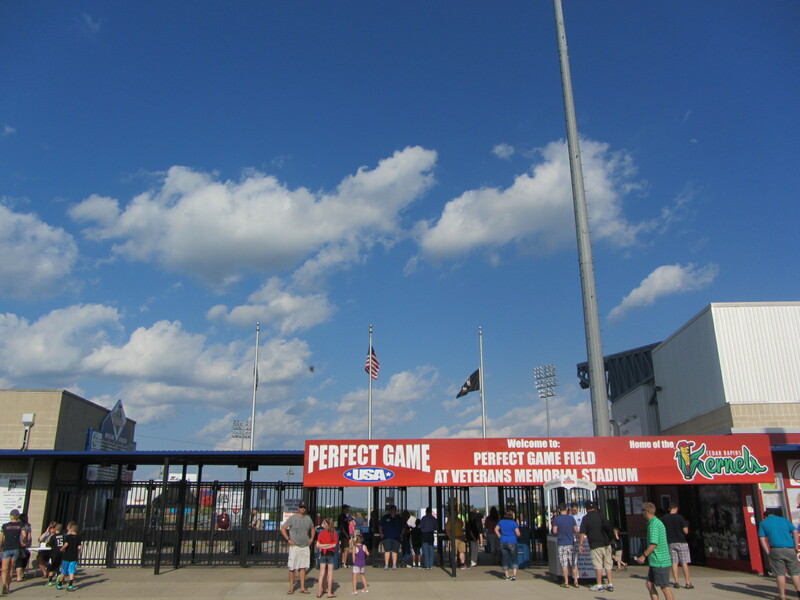 The Kernels play at an awkwardly-named facility by the name of “Perfect Game Field at Veterans Memorial Stadium,” which opened in 2002 in the same location as the “old” Veterans Memorial Stadium (which opened in 1949). 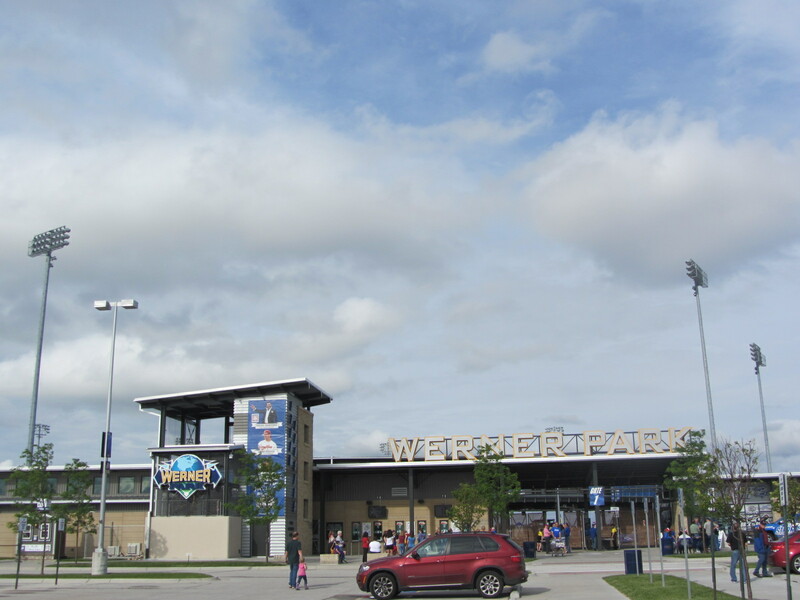 The ballpark is located just off of “Kurt Warner Way,” named in honor of the Cedar Rapids high school graduate turned Super Bowl MVP. 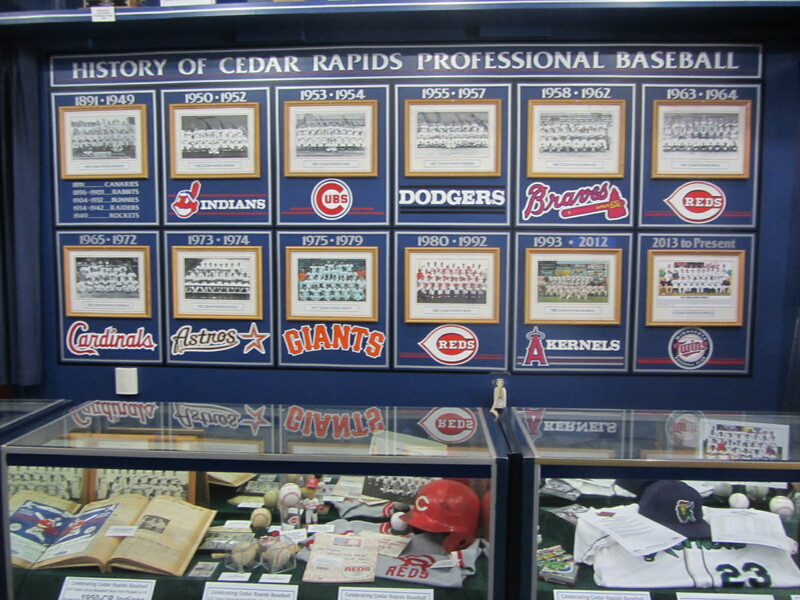 I had never been to Cedar Rapids before — in fact, this was the last Midwest League team I had yet to visit — and I really didn’t have too much of an idea regarding what to expect. 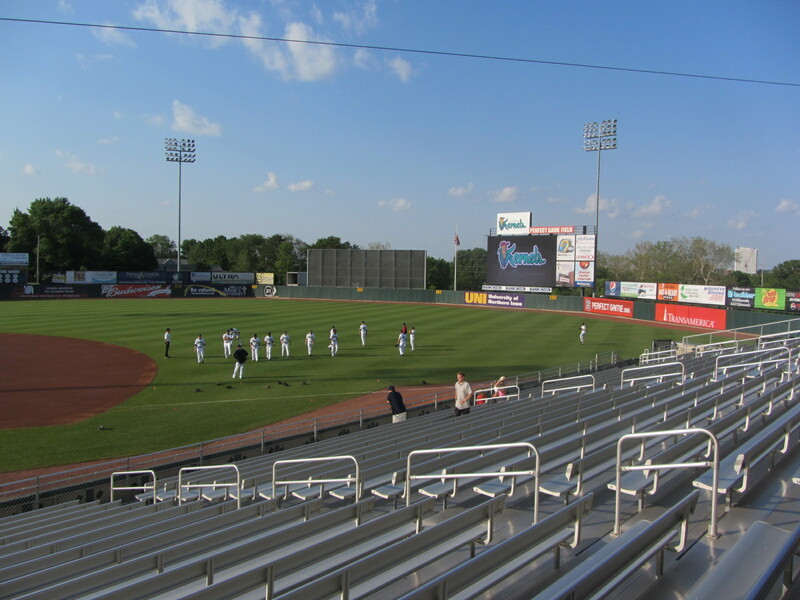 I guess, if anything, I was expecting a more sedate Midwest League atmosphere. More Clinton, say, than West Michigan. 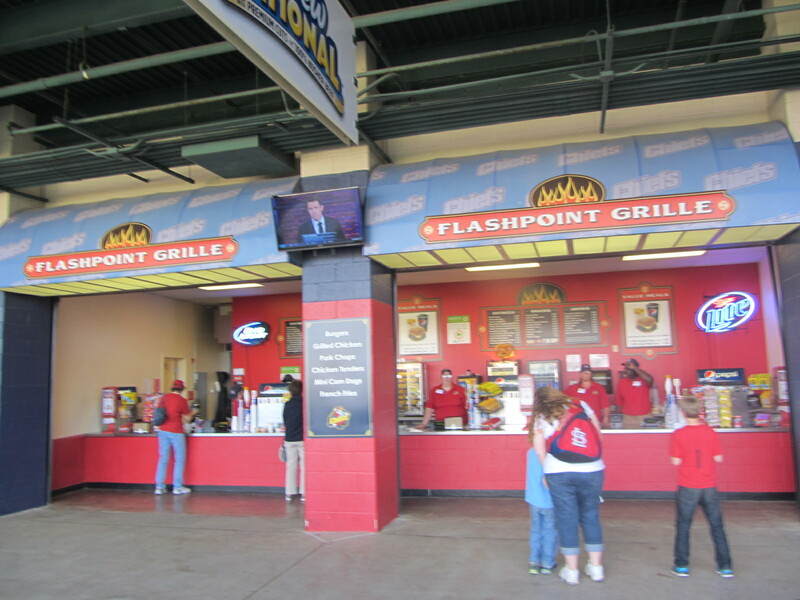 But the Kernels’ experience is fairly riotous — a blaring sound system, many theme night promos, and colorful, chaotic concourse signage. It was “Free Money Wednesday” on the evening that I visited, sponsored by a local credit union. It’s simple — upon entering the ballpark, fans are handed an envelope that contains anywhere from $1 (likely) to $100 (unlikely). The view from the concourse behind home plate featured blue sky aplenty. This was a recurring aspect of this particular trip. 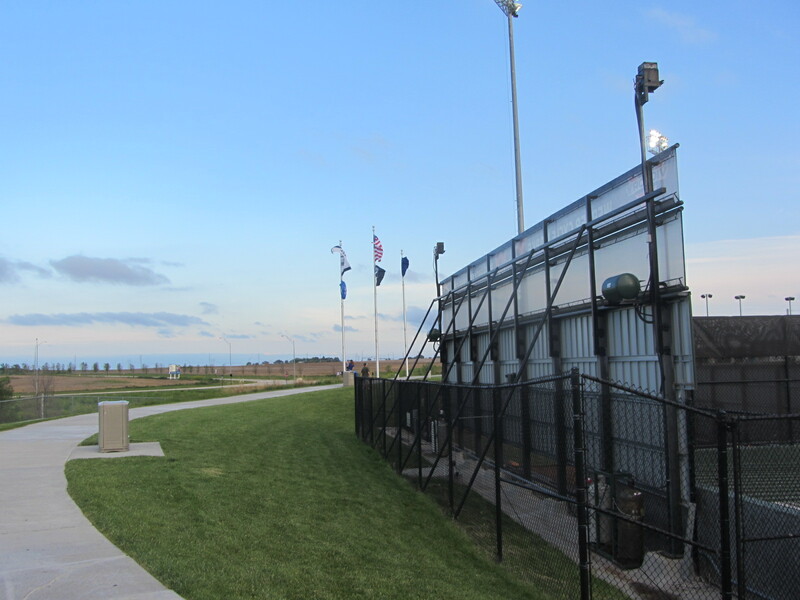 Maybe I got lucky as regards the time of year that I visited, but the early evening sky in these Iowa baseball locales was consistently beautiful. 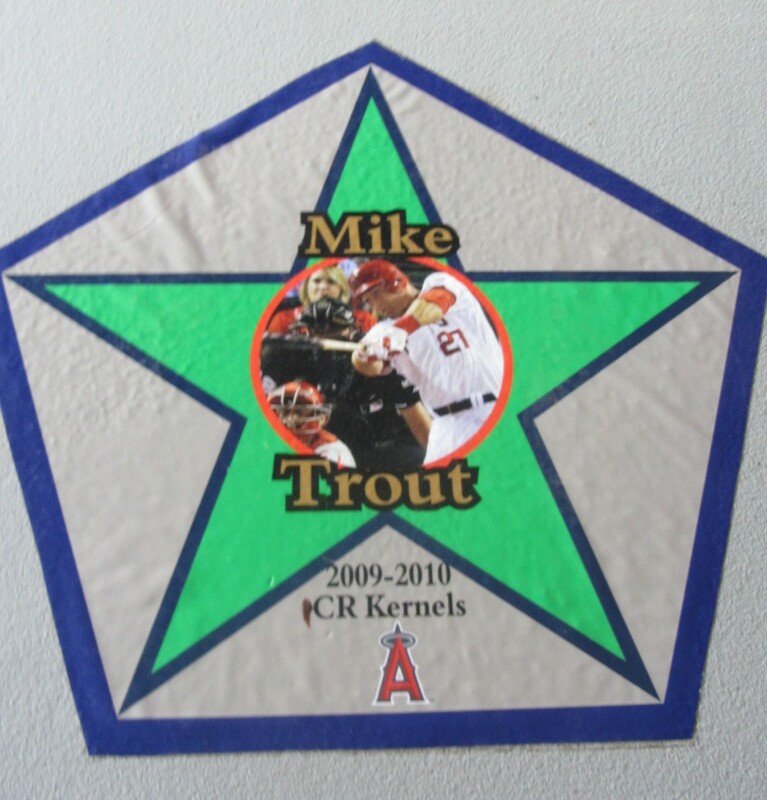 As opposed to a simple “Road to the Show” wall, the concourse is bedecked with stars honoring alumni who have gone on to the Major Leagues. Like this guy, who you may have heard of. And speaking of hard liquor: Prior to the game, I was delighted to hear an announcement to the effect of “Fans, while the pitcher is warming up in the bullpen, let us remind you to warm up with Cedar Ridge Iowa bourbon whisky.” If I hadn’t been on the job, I most definitely would have taken them up on this offer. 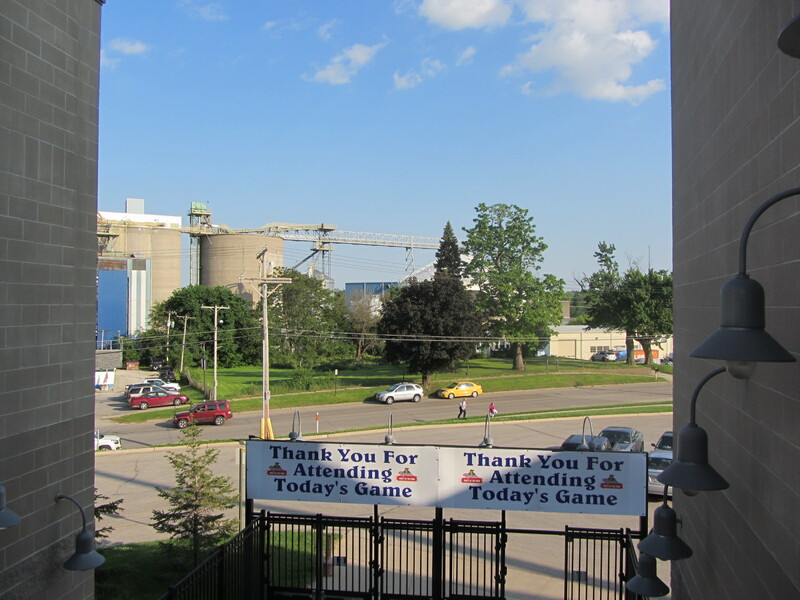 Beyond the ballpark lies an industrial facility of some kind. I neglected to find out what said facility is dedicated to the production of. 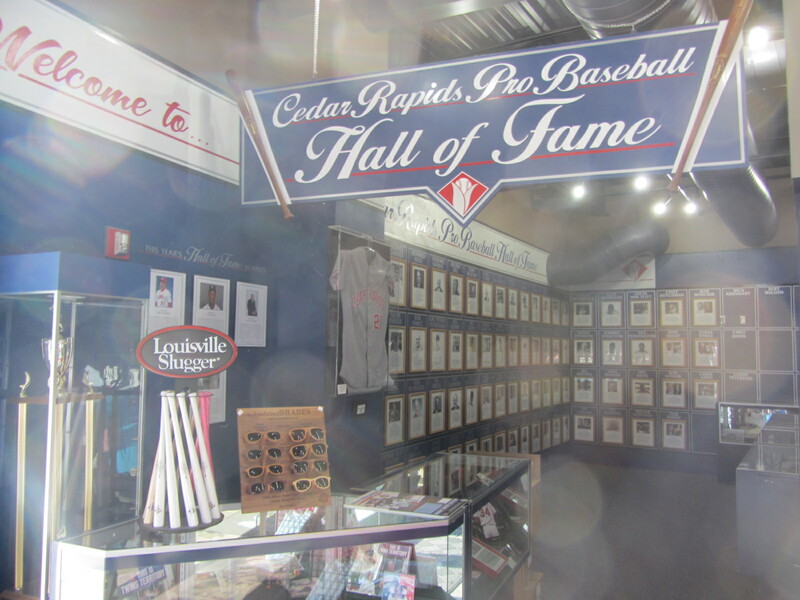 In the midst of these idle pre-game wanderings, I came across the “Cedar Rapids Pro Baseball Hall of Fame.” It is located within an annex of the team store. As the above image illustrates, the Hall of Fame was not in a particularly photogenic mood on this evening. This didn’t come out either, but it was what I found to be the most interesting thing in the Hall of Fame: a 1940 letter from a local radio station requesting permission to broadcast Cedar Rapids Raiders games from within the ballpark. 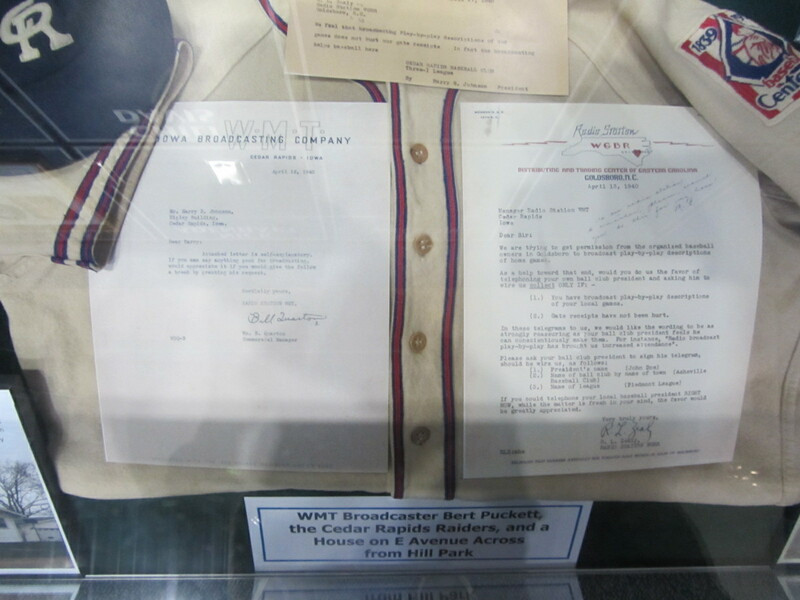 The belief at the time was that radio broadcasts would hurt ticket sales, so the team wouldn’t allow broadcaster Bert Puckett to call games from inside. Instead, Puckett called the action from a nearby rooftop. 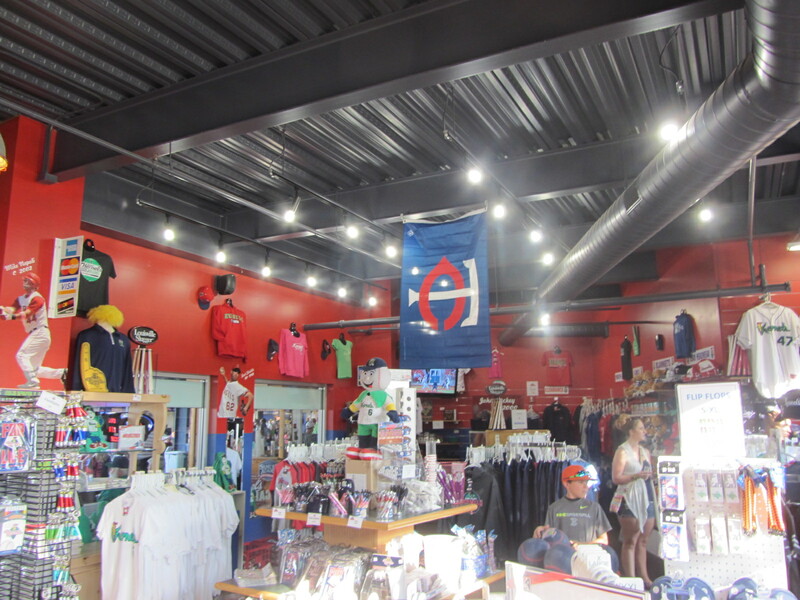 Here’s the team store, to which the Hall of Fame is attached. Broken bats will set you back a Jackson. I almost never buy items in team stores, as I have too much random swag as it is. 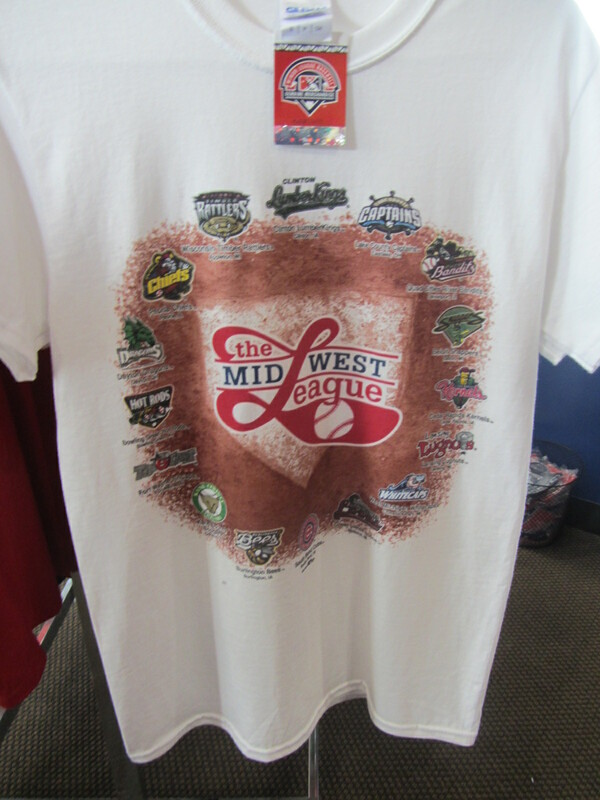 But I made an exception on this evening, purchasing this shirt featuring the logos of all Midwest League teams. Why? 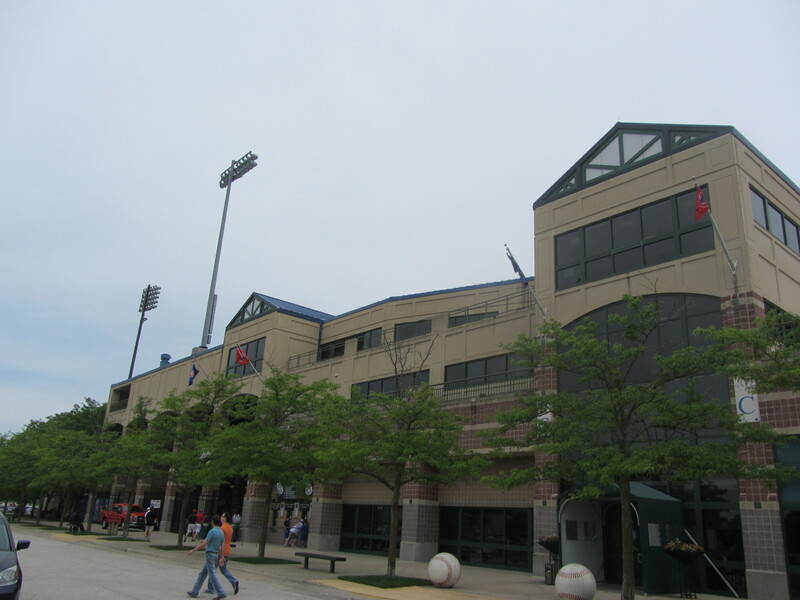 Because, now that I was in Cedar Rapids, I had successfully visited all 16 Midwest League clubs. Career milestone! 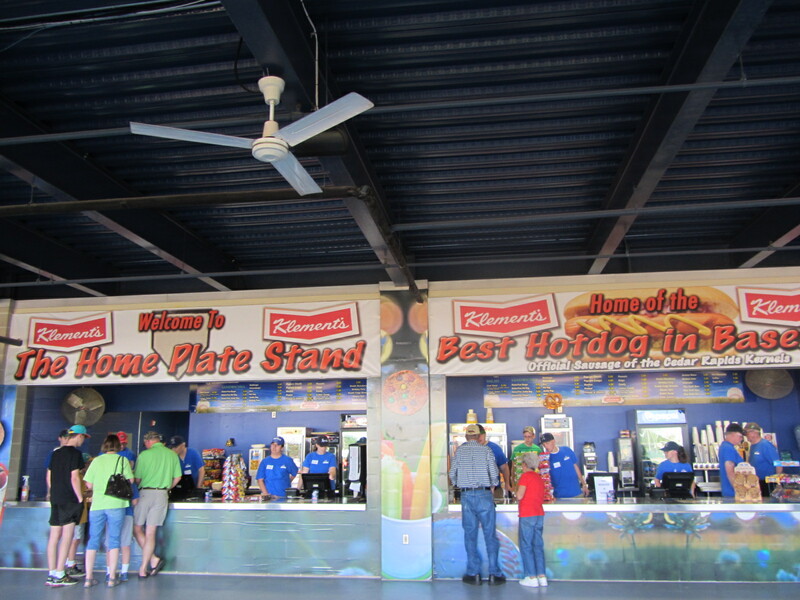 Did I mention that Kernels concourse signage is rather riotous? 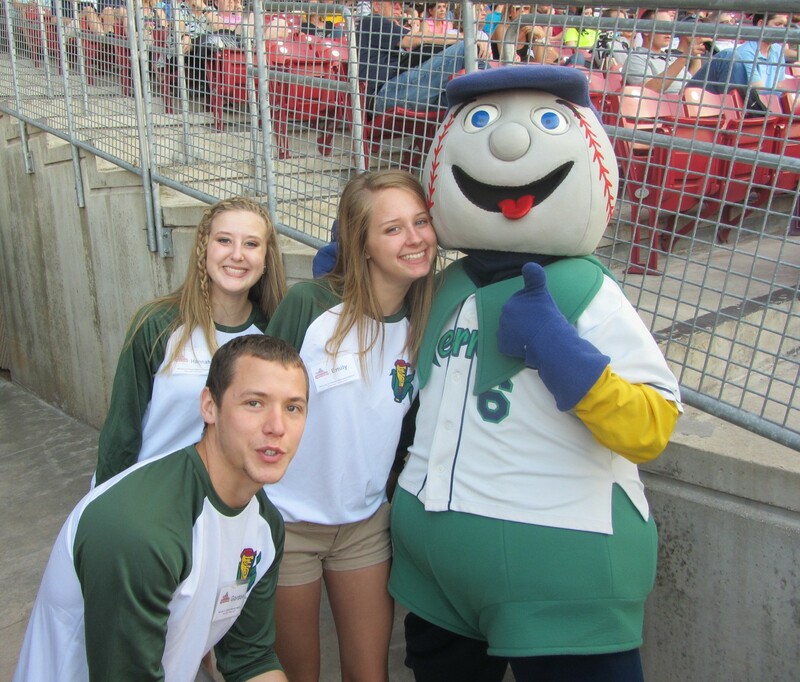 Check out these concession stand photos featuring piece-of-corn mascot Mr. Shucks. At this point in the evening, the game was ready to begin. It’s funny how that happens. I think my favorite National Anthem performances are those sung by local youth choirs. And with that it was time to, yes, play ball. 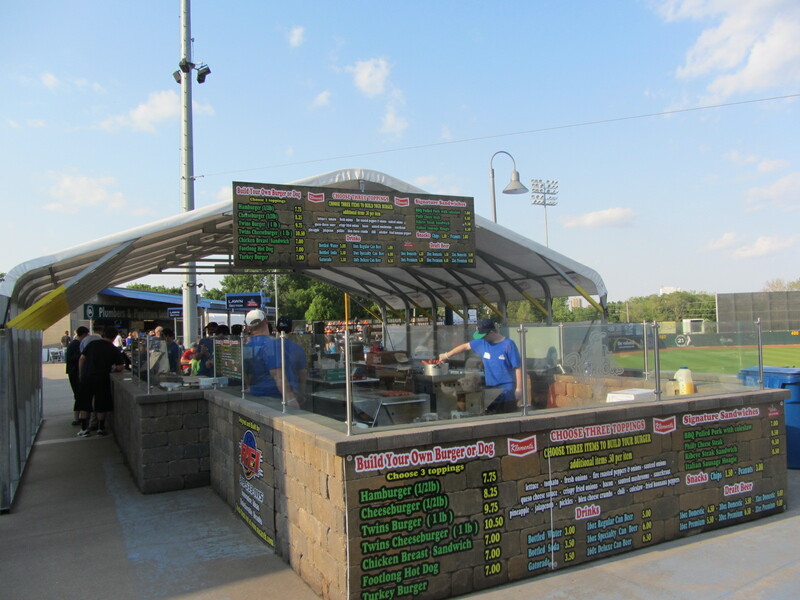 When it comes to my Cedar Rapids experience, there are many more morsels, nuggets and, of course, Kernels to report. Stay tuned.